Within the past couple of years, you might have heard that bees are in trouble, growing scarcer, and suffering from a mysterious ailment called Colony Collapse Disorder, or CCD. A variety of culprits have been fingered in causing this syndrome, including pesticide use, parasites, loss of habitat, and diseases. To study bees, both native and the non-native honeybee, scientists decided that they needed a method to determine the numbers and spread of different pollinators. 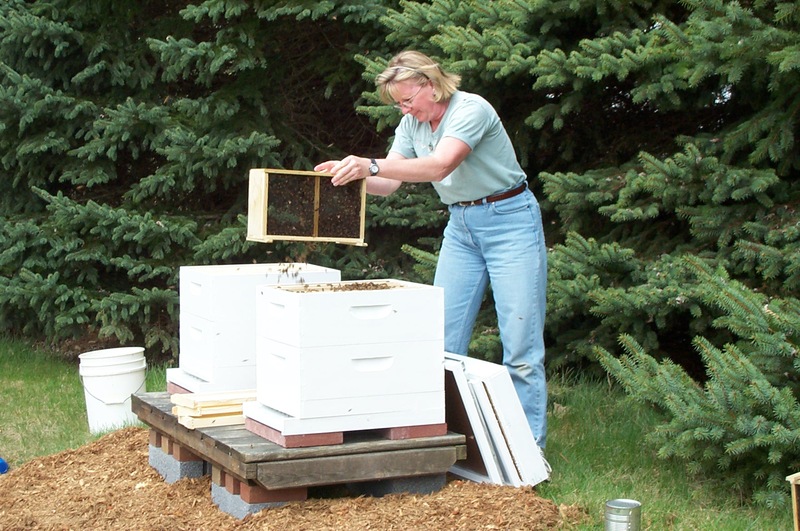 To accomplish this, in 2008 a survey was launched enlisting and empowering local citizens in reporting observations about bees in their own backyard or deck called The Great Bee Count. The Great Bee Count, recruits citizens across the United States and Canada to plant sunflowers and observe all types of bees visiting the flower in a 15 minute time period daily for a week and record their findings on-line. The first Great Bee Count took place about 7 years ago and countless volunteers recorded their findings to help scientists to check on the prevalence of our tiny pollinators in North America. By creating a map of bee visits, scientists will be able to direct conservation efforts exactly where they are needed. The data is called ‘trend data’ and showed that in some parts of the country the bees are doing very well, but in other parts like Florida where pesticide use is widespread, the bees are not nearly as numerous. I participated last year and counted at least a dozen bees on my sunflowers in a 15 minute period daily in my backyard in Maryland which shows that this part of the country is above average ‘bee friendly’! 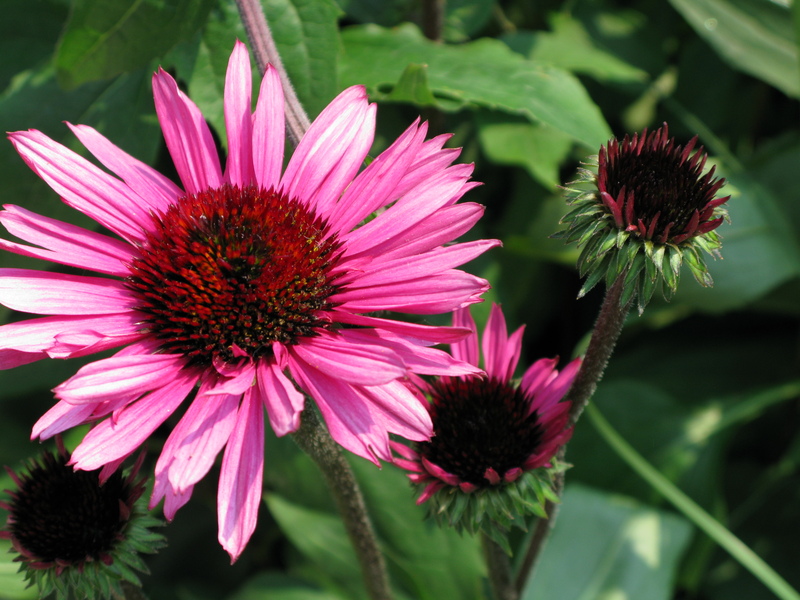 Now is the time to order those seeds and get your garden ready to plant your sunflowers. Lemon Queen is the preferred variety of sunflower seeds. It is important to check to make sure that the seeds did not receive a neonicotinoid seed treatment or even better, are organic. 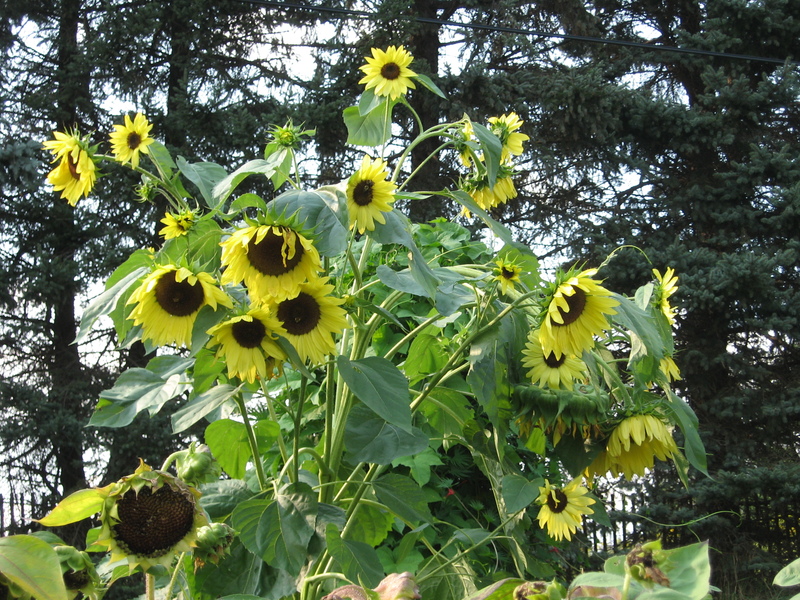 The Great Sunflower Project recommends that people look for Renee’s Garden Seeds because they have partnered with Renee for a number of years and she has offered to pass along 25% of her proceeds from seeds bought at her website to the Great Sunflower Project. The typical observer saw 2.6 bees every 15 minutes on their sunflowers. Up to 20% of the volunteers observed no bees at all which is very disheartening. Sunflowers were chosen as the standardized plant because they are ‘bee magnets’ and are easy to grow in every state. ‘Lemon Queen’ is the preferred variety because some sunflowers have been developed that have no pollen, but ‘Lemon Queen’ has visible pollen. Even if the grower did not observe bees during the 15 minute interval, that information is valuable also in informing scientists. Keeping tabs on our bees has become an important tool in studying this essential aid to our food supply. Up to one-third of our food supply relies exclusively on bee pollination. 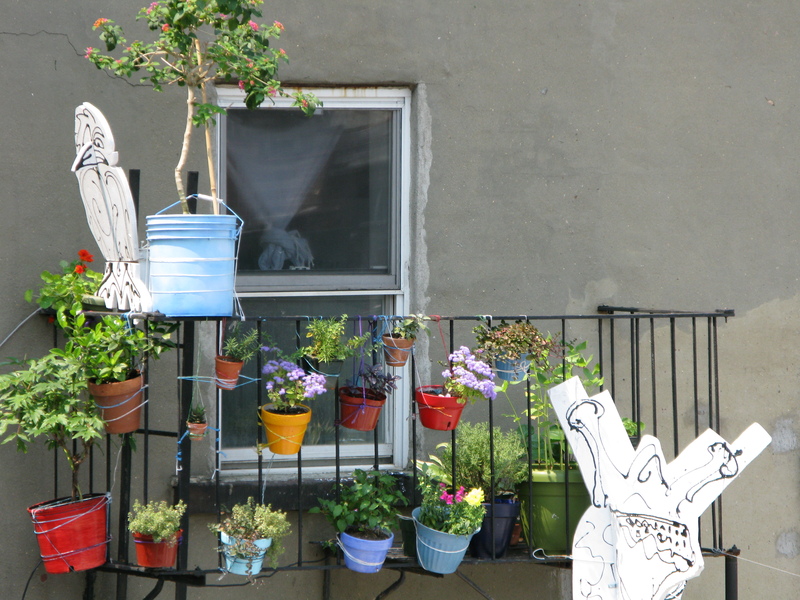 Anyone in North America can participate in The Great Bee Count even if you just have a single container planted outside on a balcony or deck. To find out how to sign up, go to http://www.greatsunflower.org/, register, and plant your sunflower seeds so you can start counting this summer! This is a great project for an ordinary person to have help out the scientific community to study our local bee populations. I would love to hear from people who are not in North America to see if there are any similar projects in their country. Please let me know if you have heard of any or participated. 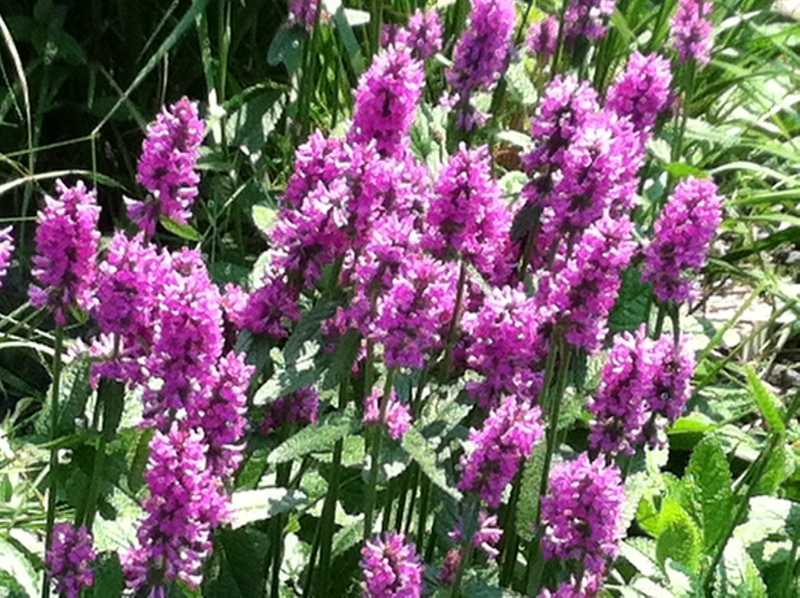 Don’t forget that there are many plants that you can plant to encourage bee visits. Go to Plant For the Bees post to see more suggestions. August is always tomato harvest time in Maryland, and even if you have just a few plants, you are inundated with a flood of vine ripened monsters with no room to put them! I think that Maryland is the perfect climate for growing the best tomatoes, hot and humid, plus a long growing season.There is nothing like the taste of a sliced tomato fresh from the garden on a sandwich! But once you have used tomatoes on sandwiches or stir fried them into vegetable dishes and made spaghetti sauce, I want to preserve them for winter eating. I have frozen tomatoes in the past because it is easier, but don’t like the texture or the condition of the finished product. 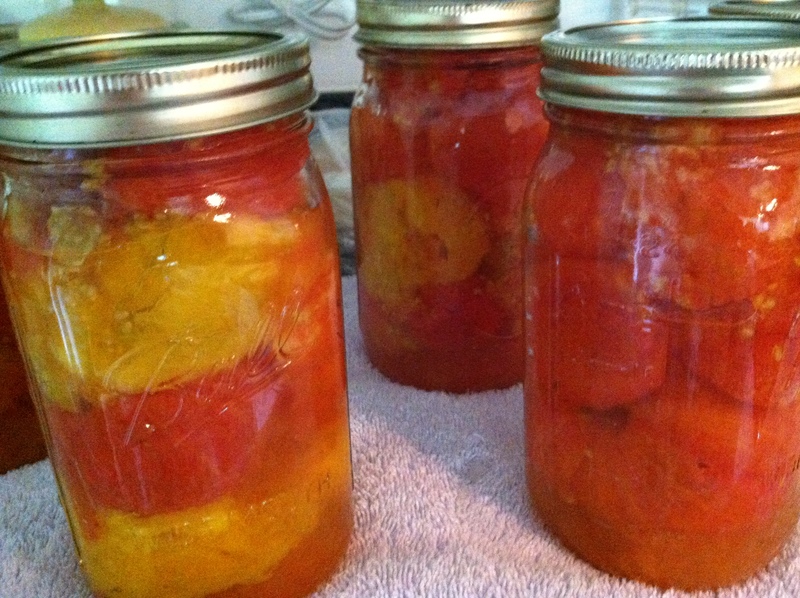 Canned tomatoes are much preferable to use in the winter months rather than the frozen product. So I learned how to can some years ago and have canned sauce, chopped tomatoes, whole tomatoes, and salsa. 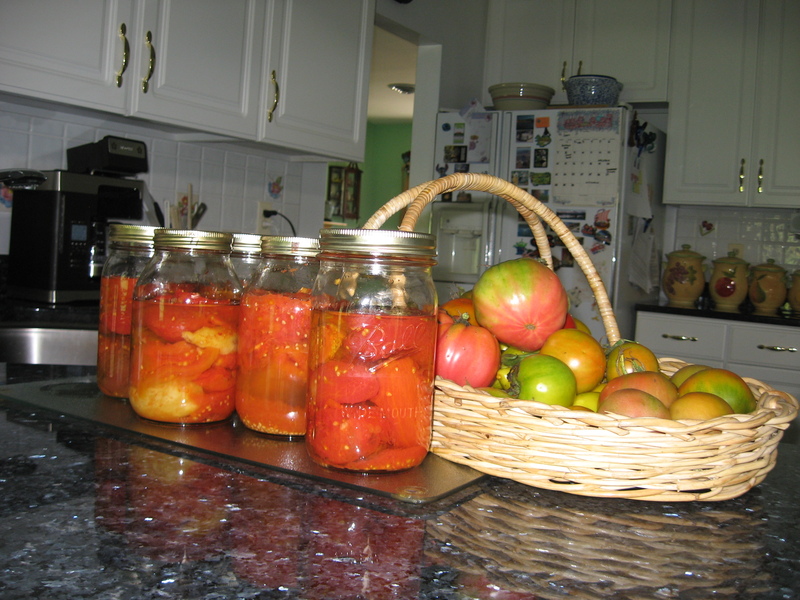 When I mention canning to people, the most common response is that it is too much work. 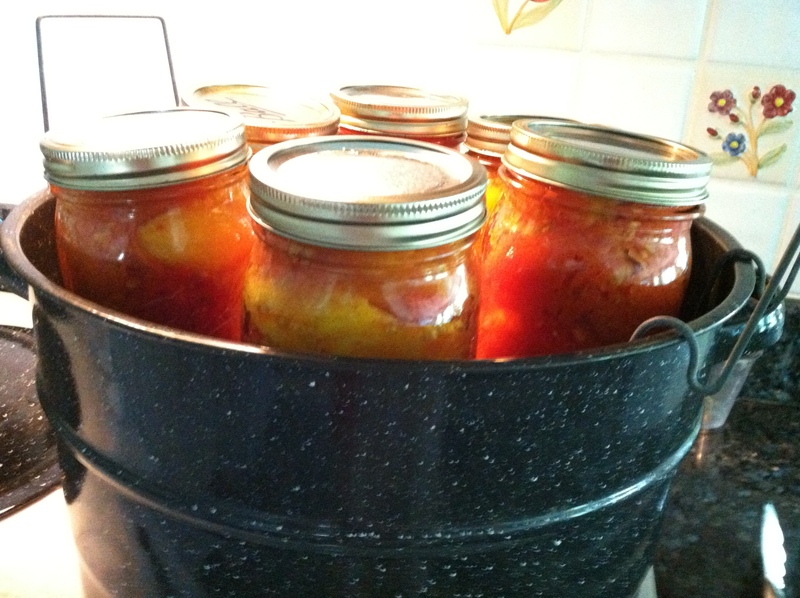 But if you are used to freezing tomatoes, canning just needs one more step – processing in a hot water bath or pressurized canner. For the improvement in taste and texture, I think it is worth it. 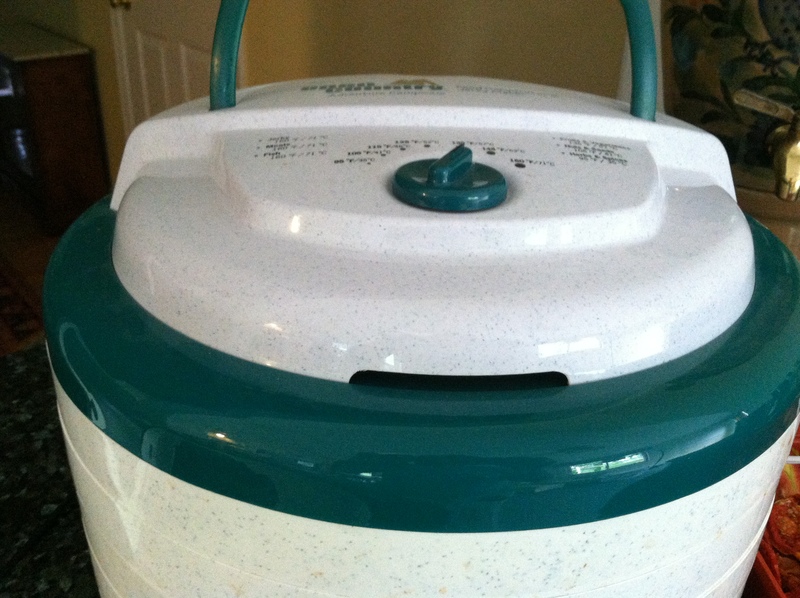 A hot water canner is very inexpensive and will last forever. Botulism is also a concern for many, but if you follow the proper canning procedure and add lemon juice to increase the acidity, you will be fine. 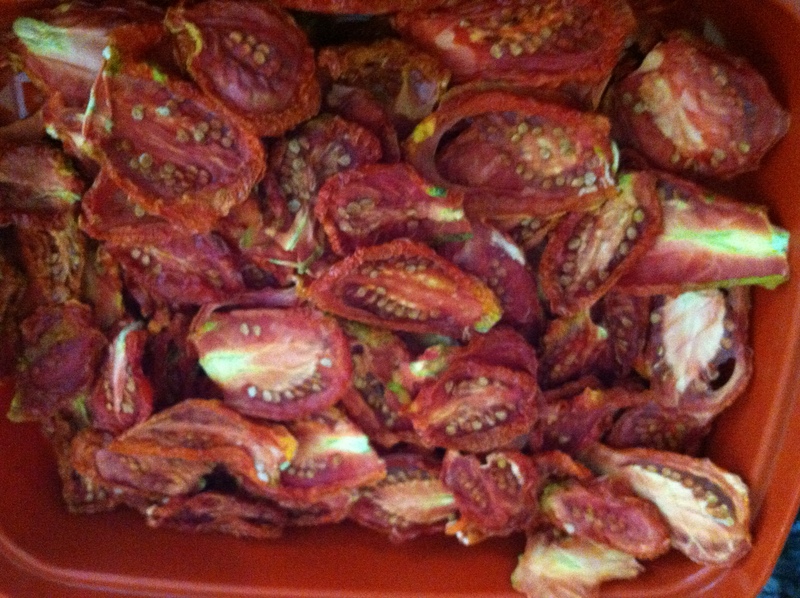 On the other end of the spectrum of preserving tomatoes is drying, and I love sun-dried tomatoes! And they are quite expensive, so it is worth while and incredibly simple. 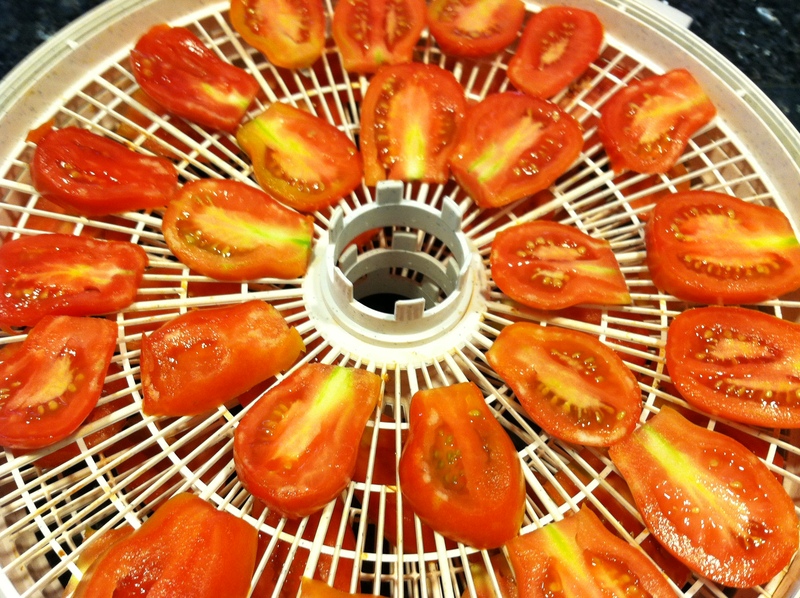 I bought a simple food dryer at Cabela’s and it is easy and efficient to use, and I usually have it on for several weeks during August drying all my Roma tomatoes. 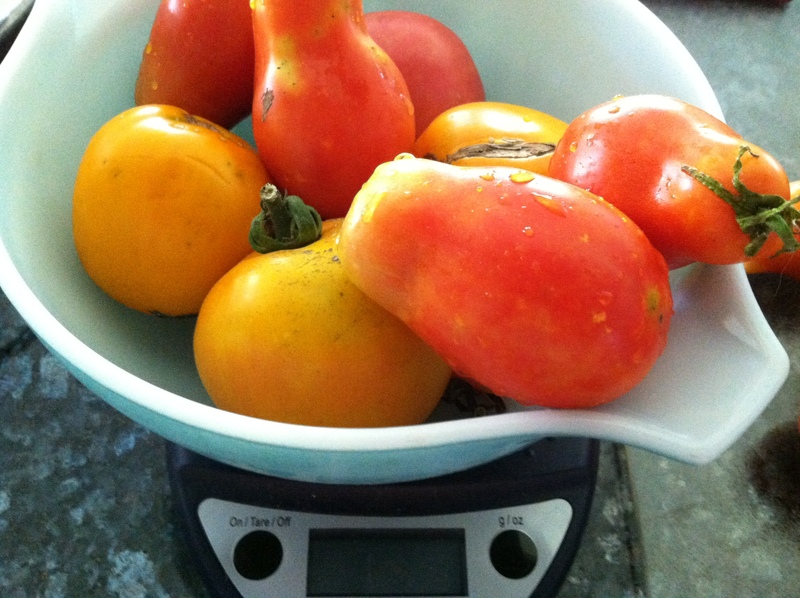 Roma tomatoes work better than regular heirloom or beefsteak tomatoes because the water content is much lower. Once the tomatoes are dried, I place them in Tupperware containers in the freezer. I tried storing them in olive oil in jars in the frig one year but they got moldy. When I need some dried tomatoes for cooking, I grab a handful out of the freezer and place them in a bowl of water in the microwave and heat them up. 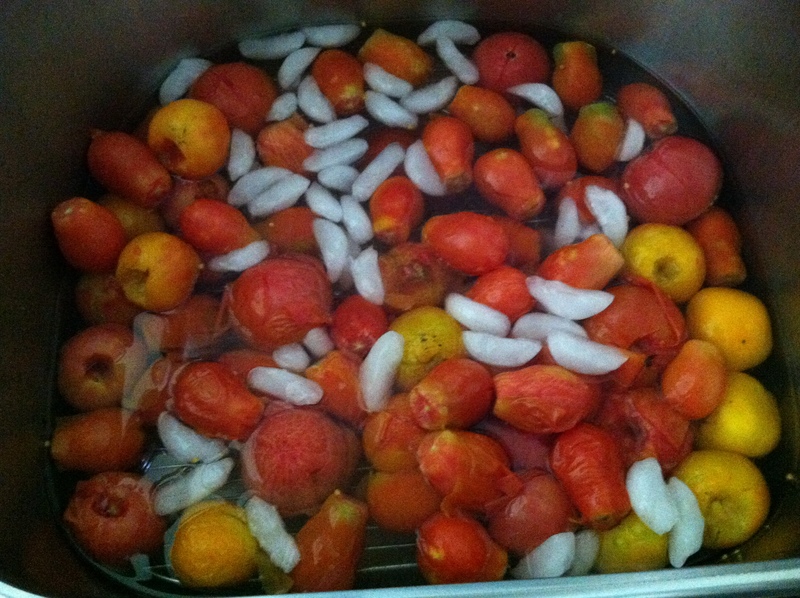 They will reconstitute very quickly in the hot water and are ready to use in recipes. Sterilize your jars in the dish washer at the highest heat along with the rings. Or if you prefer, put the jars in the hot water canner and boil them. 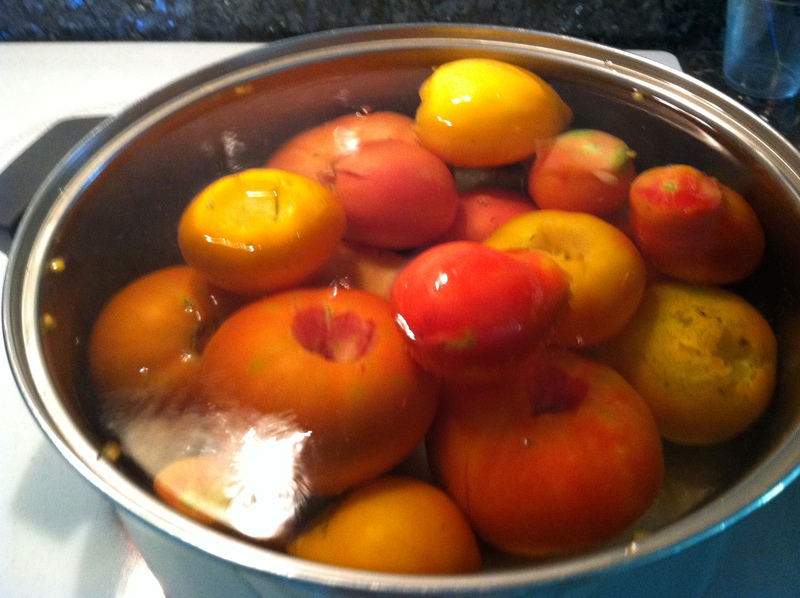 You have to boil this water anyway to can the tomatoes, so this might be the easiest and most efficient way. Place the lids and rings in a small saucepan of boiling water. Keep the jars and lids in the water until ready to use. 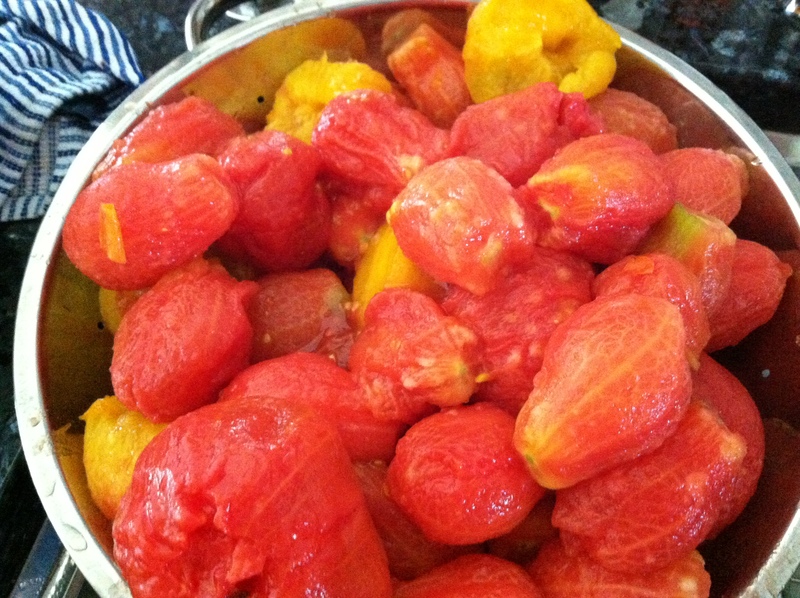 In a saucepan, boil some water to fill the jars of tomatoes to the top. 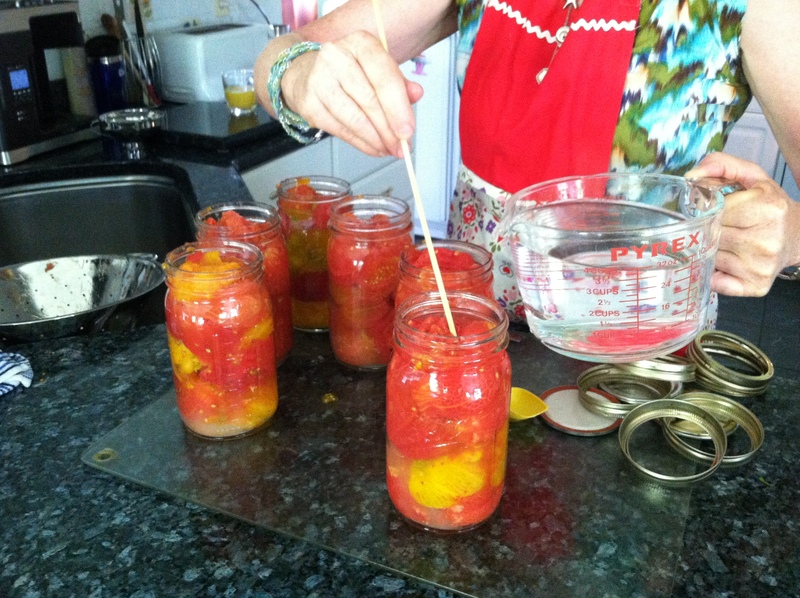 Fill the sterilized jars with tomatoes. Make sure that you fill them completely. I press down lightly so as not to crush the tomatoes, but you want to fill them as completely as possible. 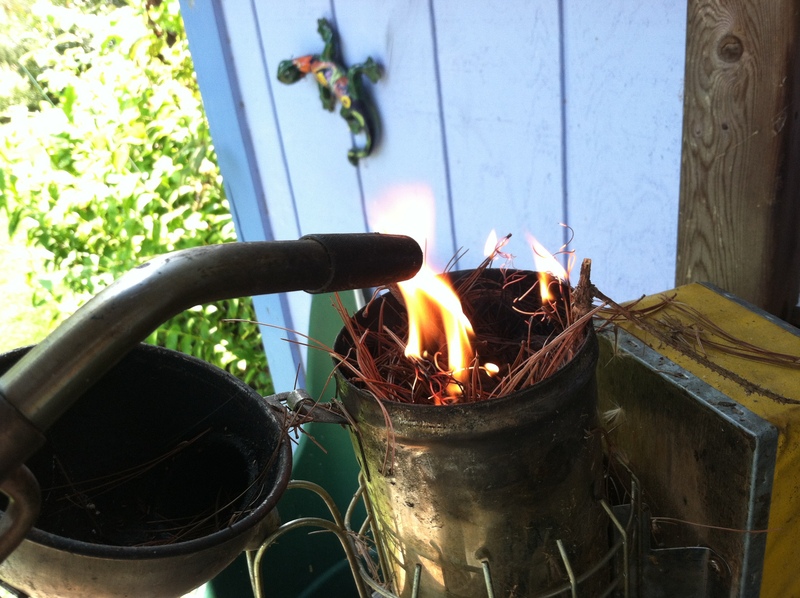 Use a wooden skewer to get rid of air bubbles and gaps. 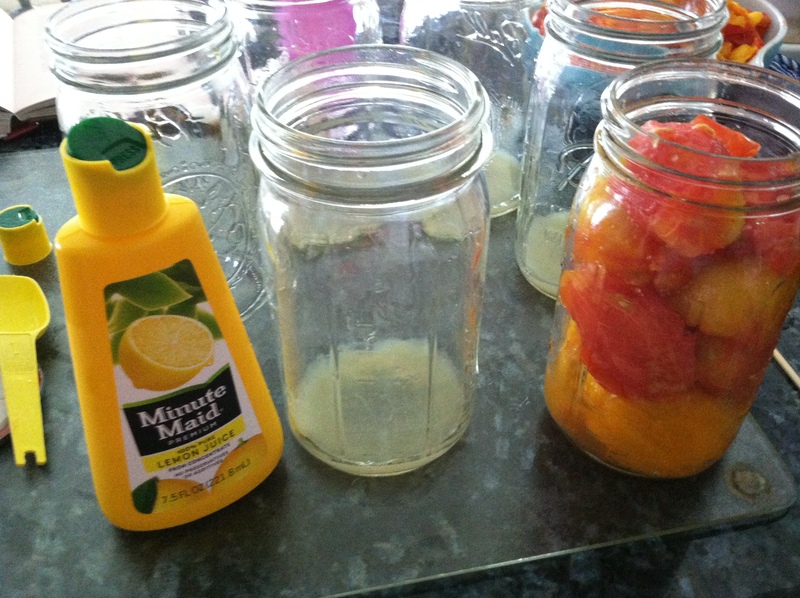 Fill the jars of tomatoes with the boiling water until the jars are full with a 1/2 inch head space. Use the wooden skewer to get rid of any air bubbles. Screw on the jar lids with rings, making sure that the rims are clean and the rings are ‘finger tight’. Process for 45 minutes. That means wait until you get a full boil and then start timing for a full 45 minutes. Lift the jars out and let cool. The jars should seal with a ‘pop’! 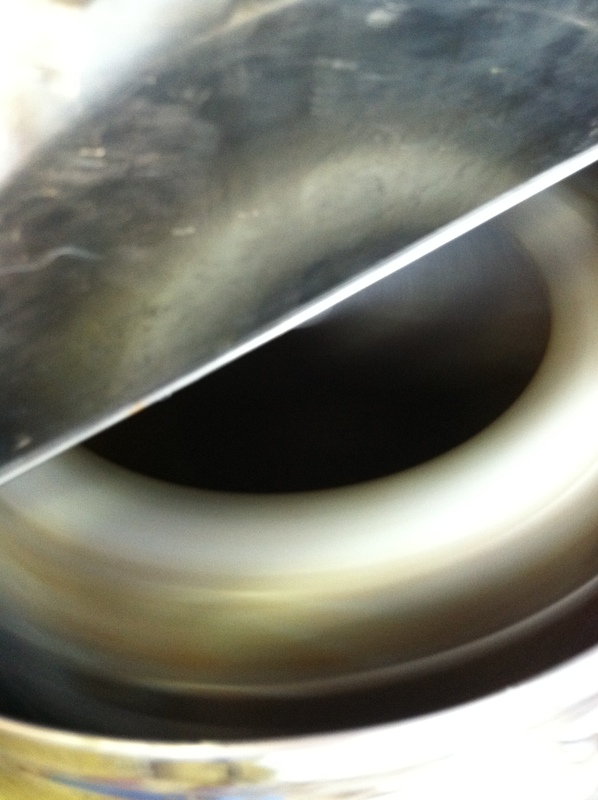 A vacuum is formed when the jars are processed. If you can press down on the lid and there is movement, the jar has not sealed. Let the jar sit for 12 to 24 hours and if it doesn’t seal, you must use it immediately or store in the refrigerator until use. Drying is my next favorite way to preserve the harvest. 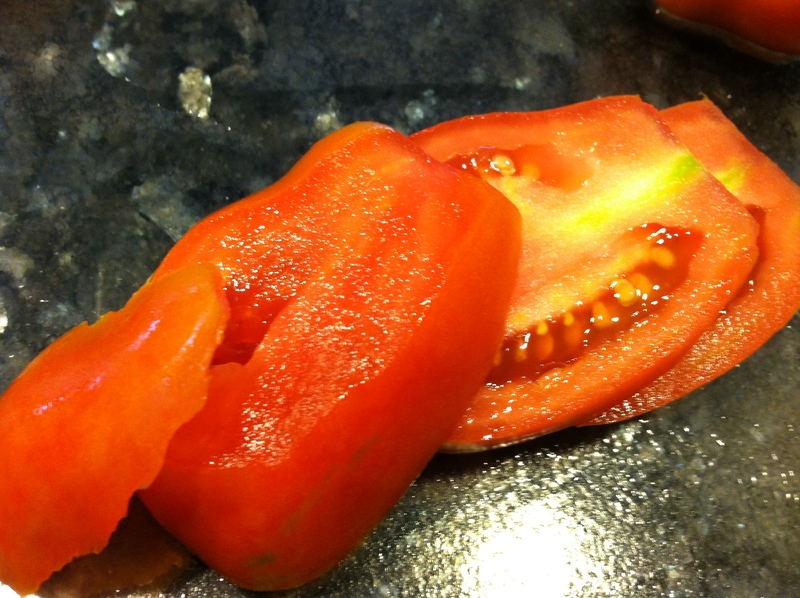 Once I have a good quantity of Roma paste tomatoes, I slice the top off and start slicing the tomato lengthwise. 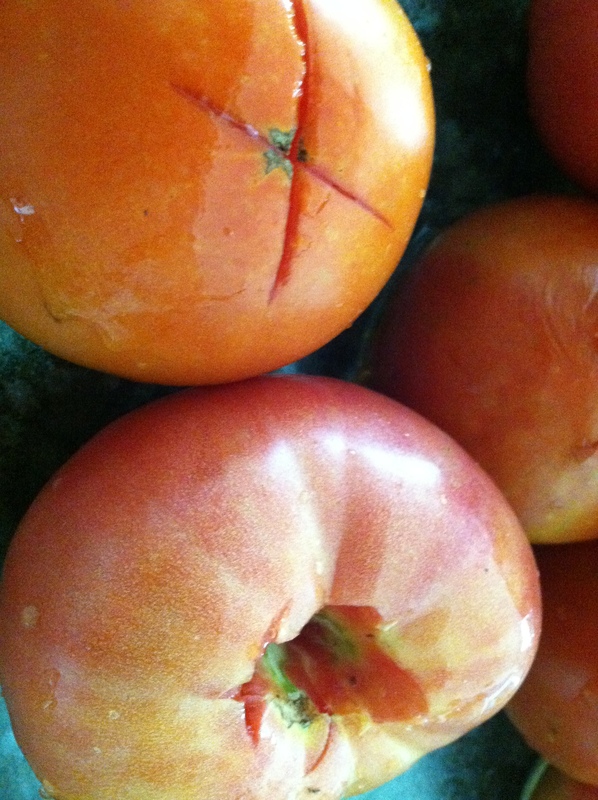 One tomato will produce 3 to 4 slices to dry. 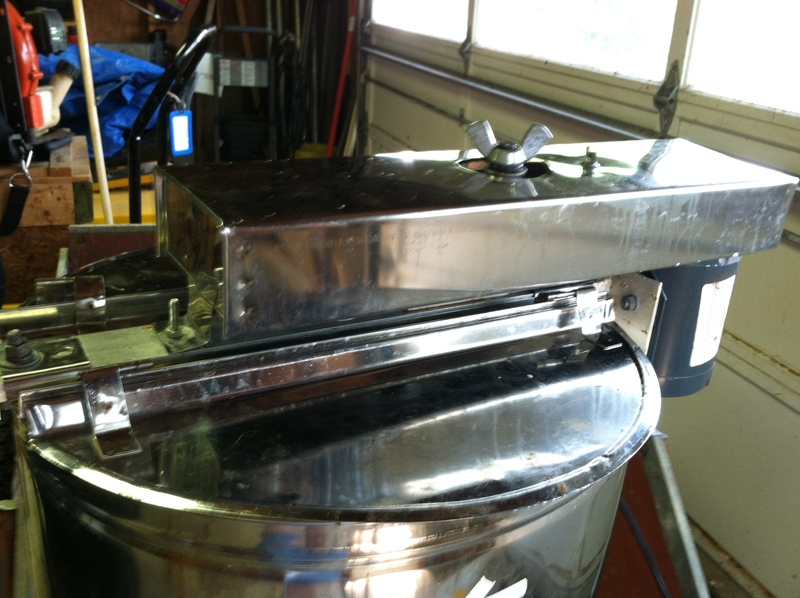 Place into a tray of a food dehydrator and plug it in. The slices will dry in about 12 to 15 hours. Make sure that they are completely dry and kind of crispy before storing into a Tupperware container. Place in the freezer until ready to use. Sustainable is the new catch word for gardening. I hear it everywhere and I think it is overused without anyone really understanding exactly what it means. By definition it means – Conserving an ecological balance by avoiding depletion of natural resources. And by working gardens, keeping chickens for meat and eggs, preserving food, adding solar panels, etc., we are all sustainable consumers in some fashion. Not fully sustainable by any stretch of the imagination but plugging away at bits and pieces of sustainability. Most of us are still on “the grid”. I have read the magazine Mother Earth News for years and I am always surprised at the number of people who are off the grid and flourishing. I am not ambitious and energetic enough to be off “the grid”, but I would love to reduce my dependence on it and have chipped away at it. Now that it is fashionable and smart to try to live sustainably, I have observed many of my neighbors have added homesteading in some way, shape, and form to their lifestyle. 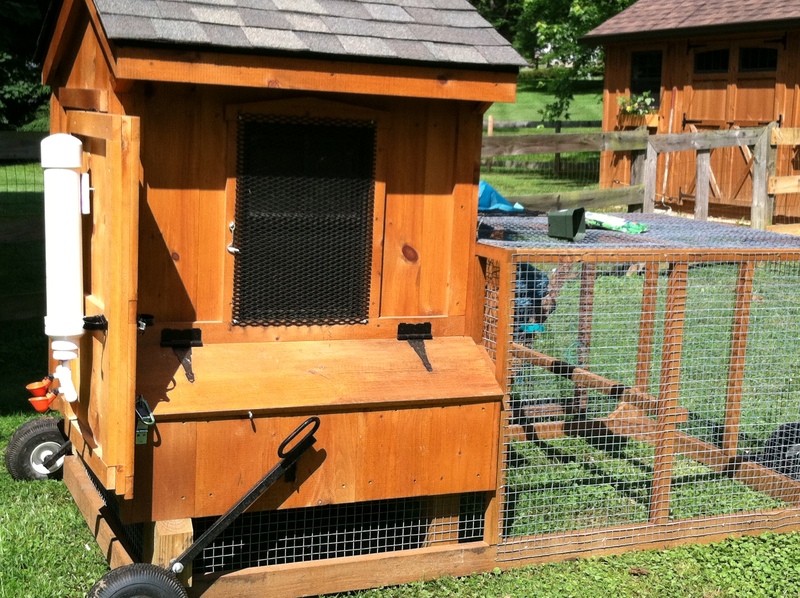 Even with a full-time job and lots of family responsibilities, many have added gardens, preserving food, and are raising chickens for healthier eating. When we get together as a neighborhood, we often talk about how sustainable our neighborhood is, and how we would work together and pull on each other strengths if there were a natural disaster. Some people are good at raising and putting up food, while others are trained as nurses or can hunt and fish. Everyone has their own unique talents to add to the mix. 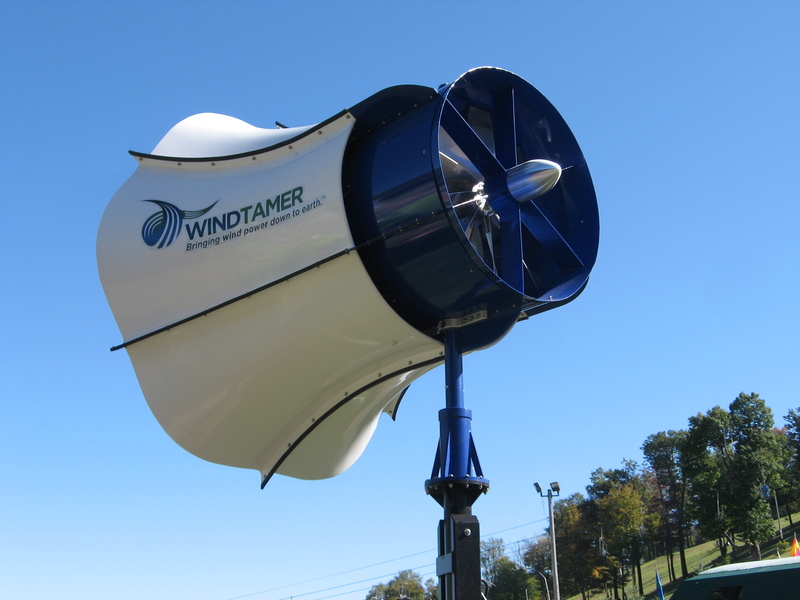 We even have pumps that could pump water from streams and mechanics that could make them work. The author, among other useful suggestions to grow food sustainably, also suggests having neighborhood food swaps every so often to trade what you have lots of, for things that you aren’t growing. I have a gardening neighbor who planted zucchini plants at the edge of her lawn and puts out a sign for anyone to pick them when ripe. 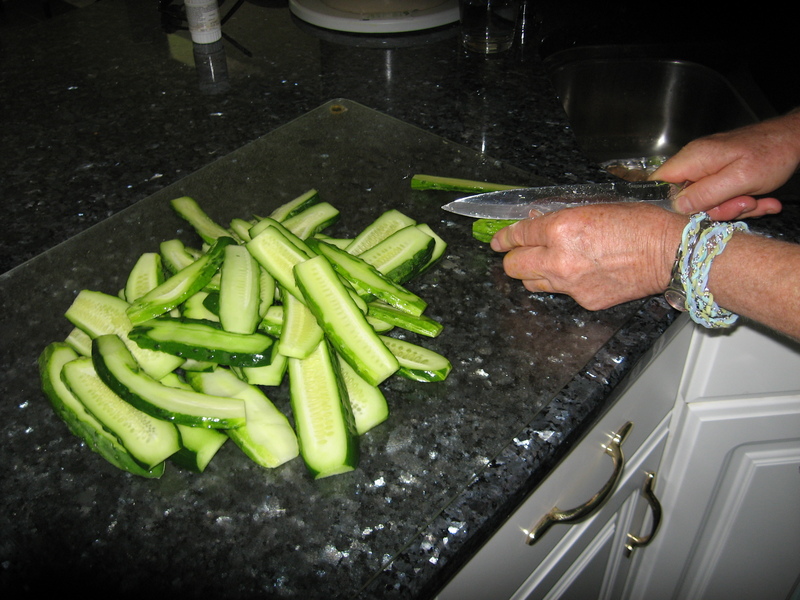 When I had bumper crops of cucumbers and had preserved all I wanted as pickles, I took the excess cucumbers around to my neighbors and gave them out. Small things, but these all add up, plus it brings the neighborhood together instead of everyone keeping to themself. With natural disasters and severe weather becoming the new normal, we really need to think about a self-sustaining lifestyle, and start getting serious about reducing our dependence on food that is trucked in from thousands of miles away. 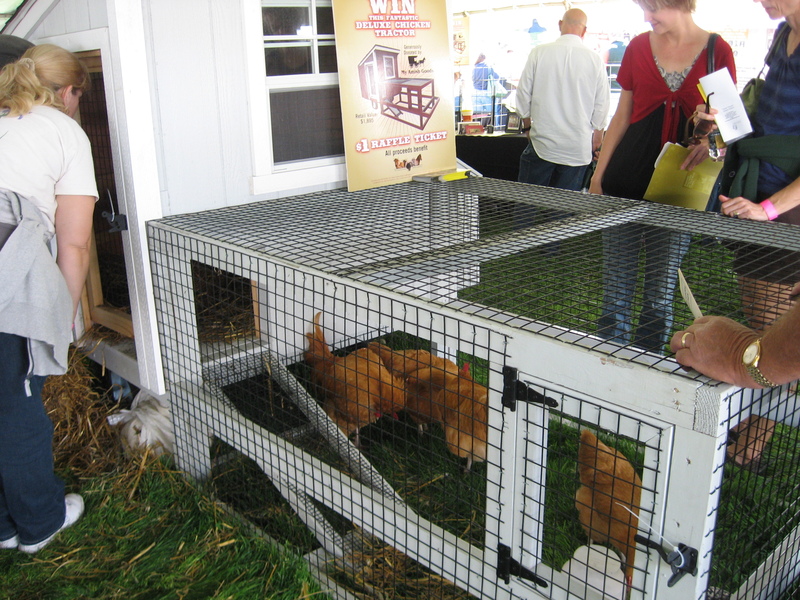 So, I have highlighted some areas in this post where my friends and neighbors are making a difference with suburban homesteading. 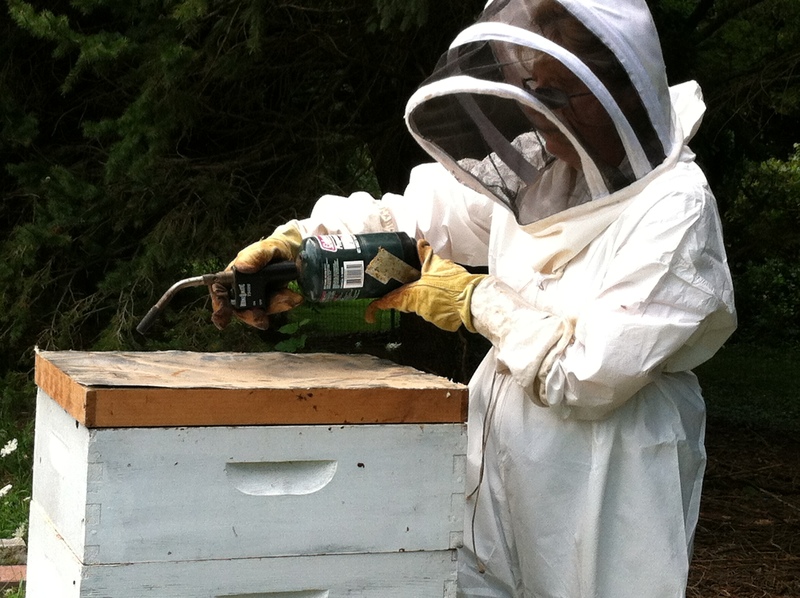 I love beekeeping but it isn’t for everyone. Managing bees is not easy, can be rewarding at times but also very frustrating when things go wrong, and they can go wrong quickly! 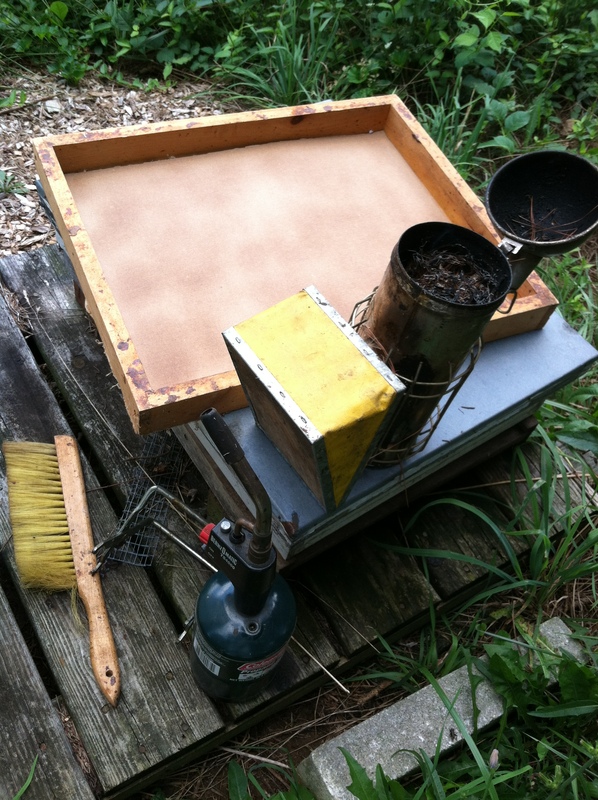 I call beekeeping my expensive hobby as you can sink a lot of money into equipment, sugar for feeding, and supplies. 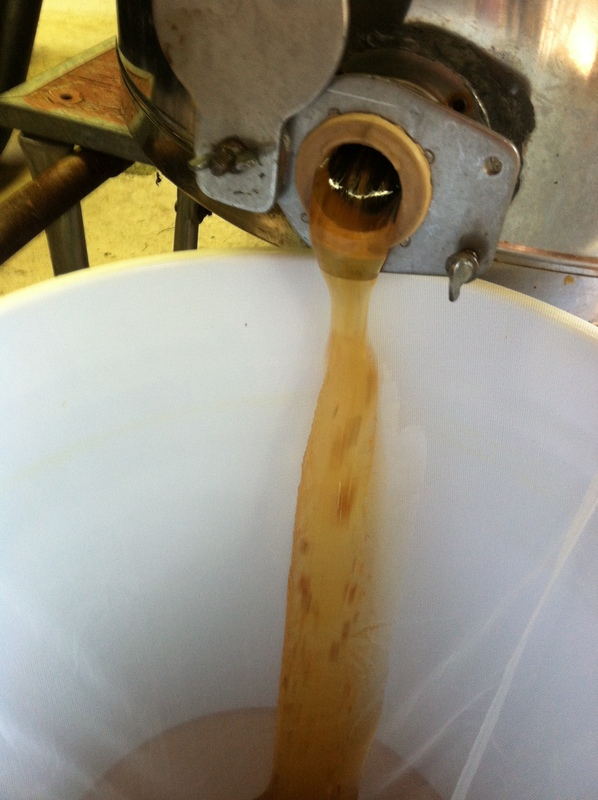 But the payback can be spectacular when you see all that honey flowing out of the extractor. 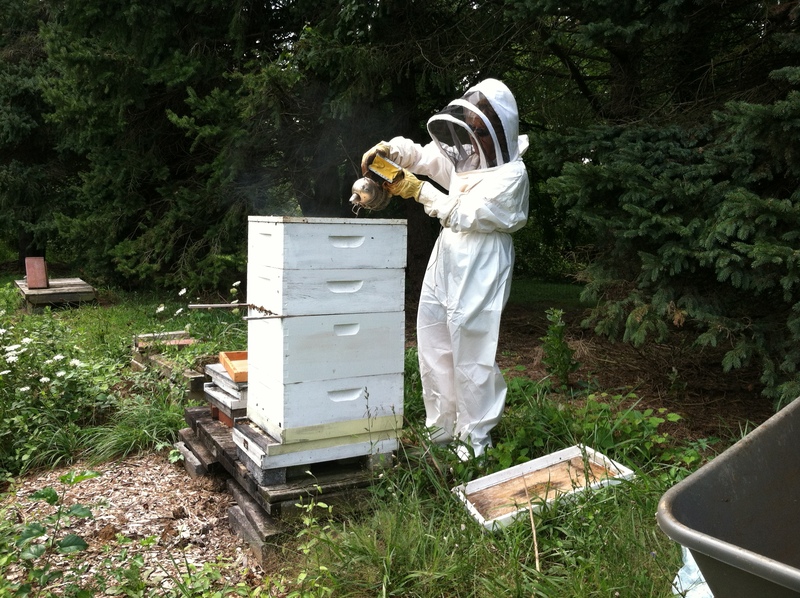 I don’t want to discourage anyone from setting up bees because it is extremely interesting and has given me lots to talk about over the years, but it is a committment of time and energy. 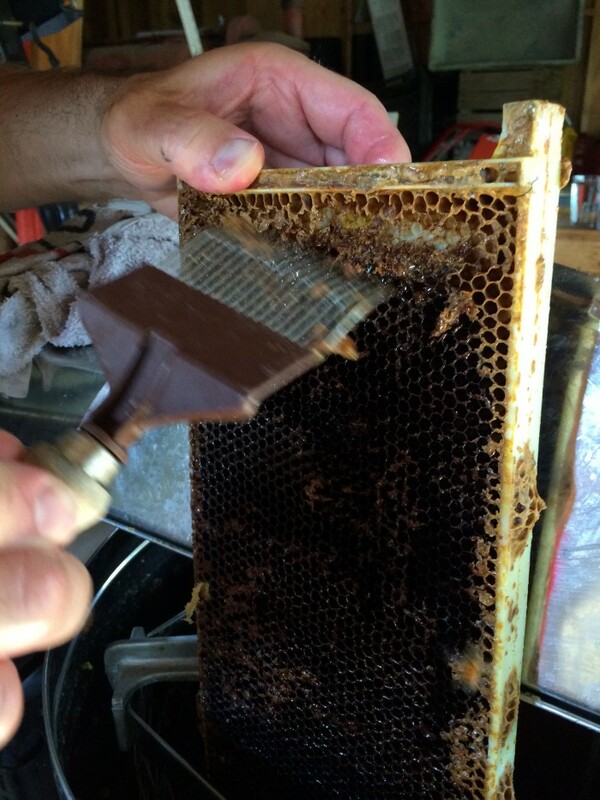 Doing things right and getting lots of honey! 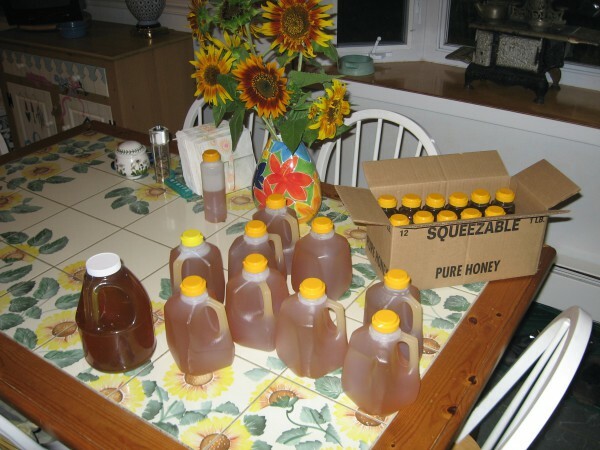 Honey is also a commodity that others love to barter for. 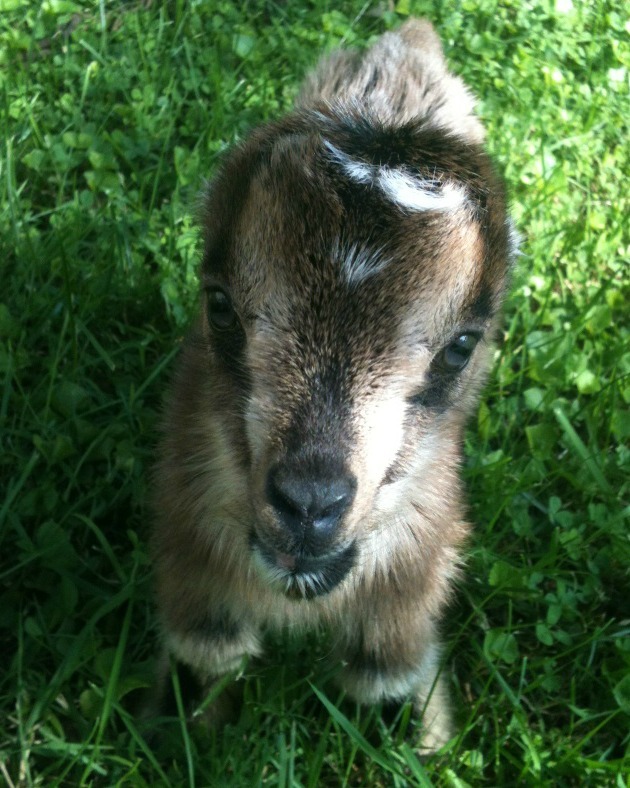 I have a friend who raises 28 goats for cheese making. She has several varieties including LaManch’s, Alpines, and Nigerian Dwarfs, and milks them everyday which is a huge committment. She produces chevre, goat cheese cheesecakes, crotin – a 14 day aged soft goat cheese, cajeta – a goat milk caramel sauce, and goat milk ricotta. 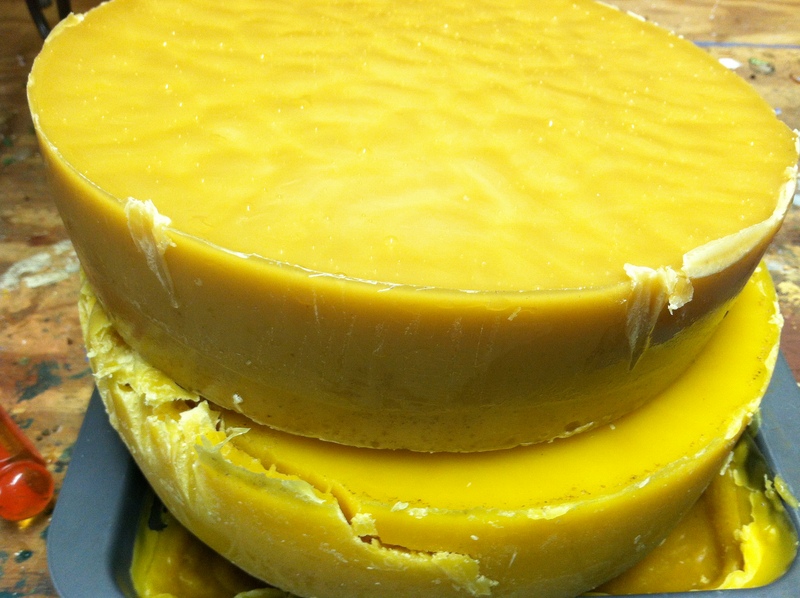 We have traded in the past – honey for cheese, and the cheese is delicious! 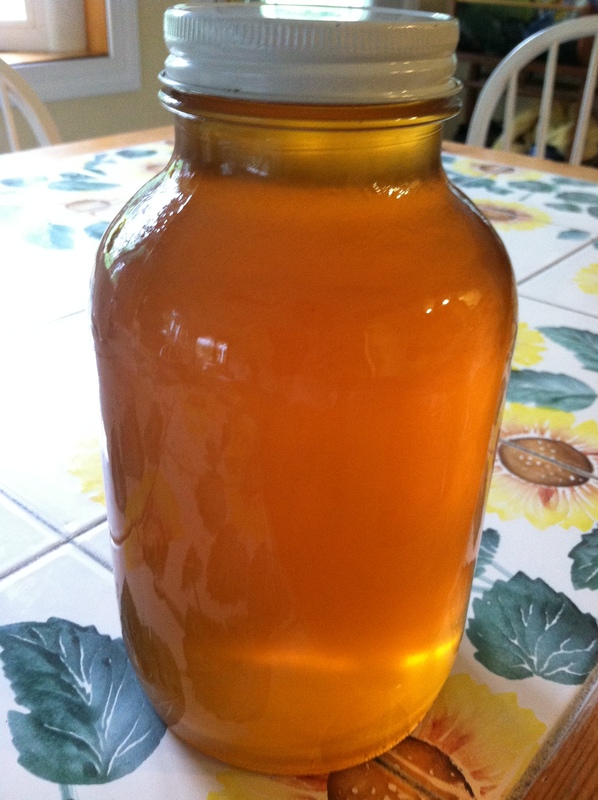 When I extract my honey, I will be calling her to trade again. 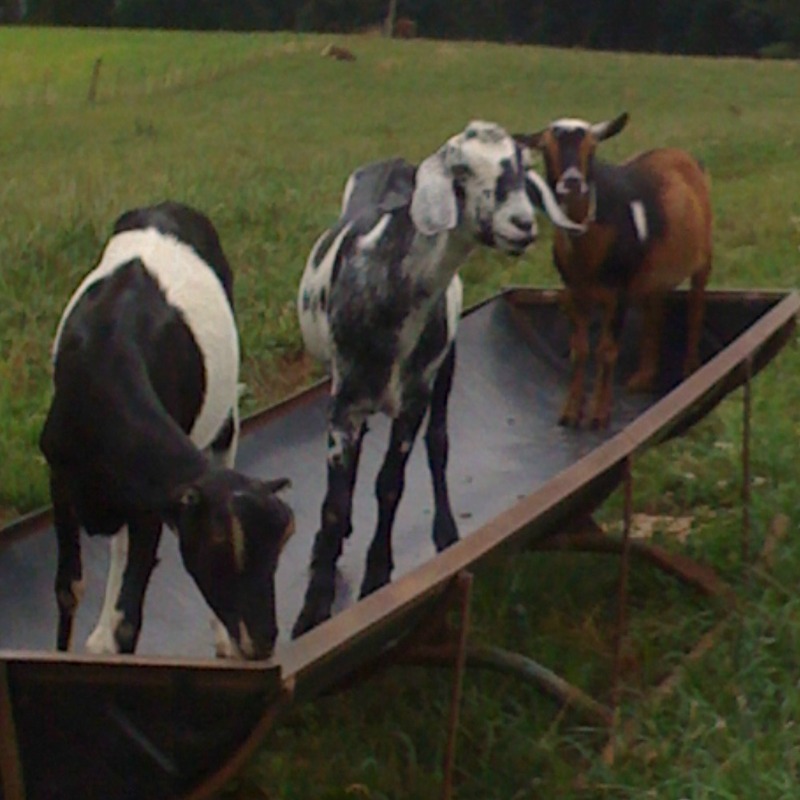 There is nothing like freshly made goat cheese! I have made mozzarella cheese myself but it was a lot of work and you need a lot of unprocessed milk to make it worthwhile. I really didn’t enjoy it and it made my kitchen a mess. So I would much prefer to barter than make cheese. 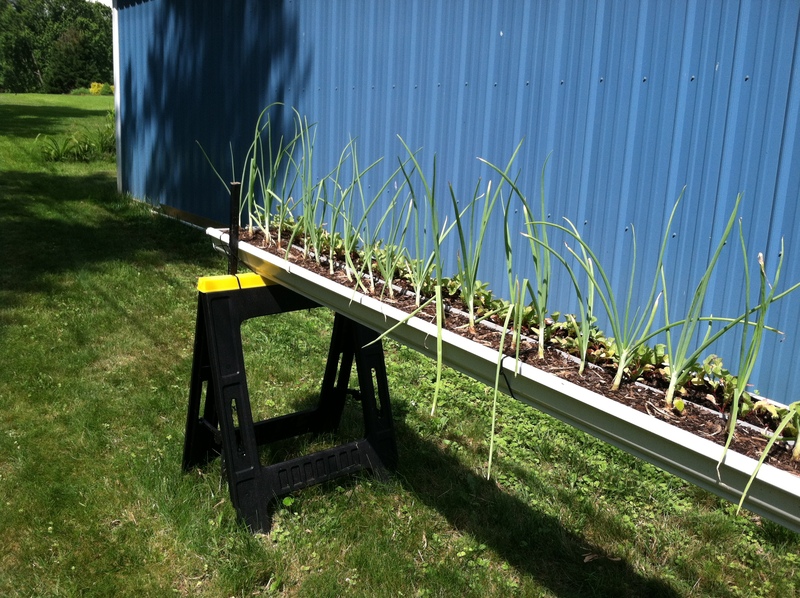 Having a vegetable garden in a container or in the ground is simply the easiest way to reduce your dependence on the food supply chain and one of my neighbors has gone about it in a big way. 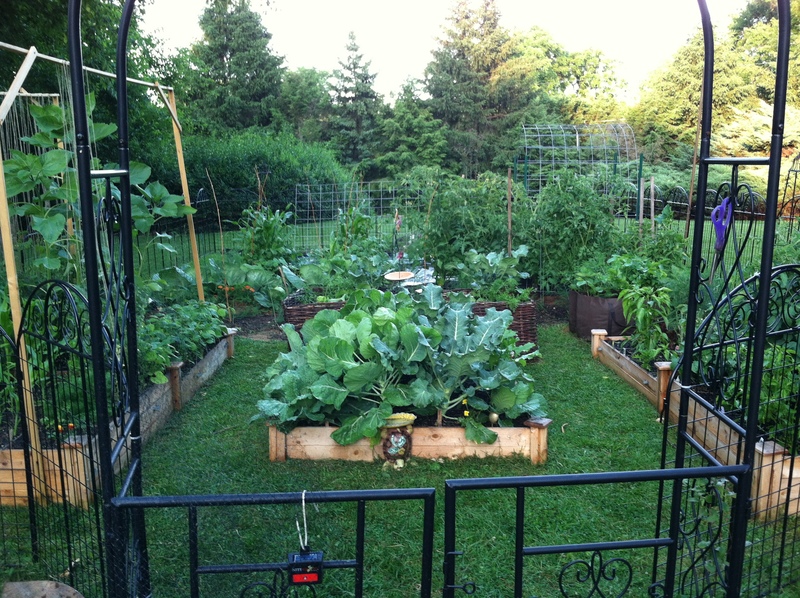 In her front yard, she has created an intensively planted vegetable garden, using raised beds, square foot gardening, and lots of vertical structures to make the best use of space. Because deer can be a problem, she has fenced things in which also creates space to grow vines up using the fence for support. Grass was left in the pathways so that you don’t walk on the soil and compact it. 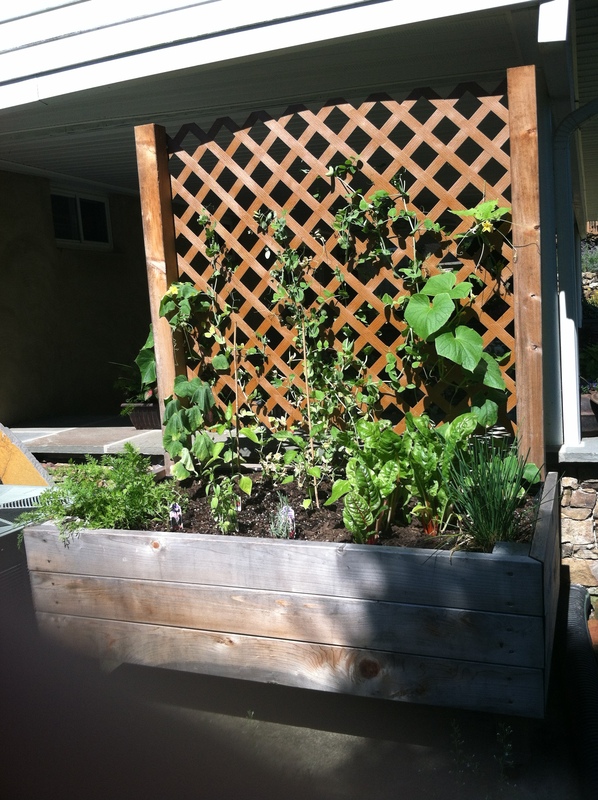 There are several types of raised beds used, to pack as much stuff into limited space – traditional wooden, woven willow, and a synthetic material that looks like heavy black plastic. 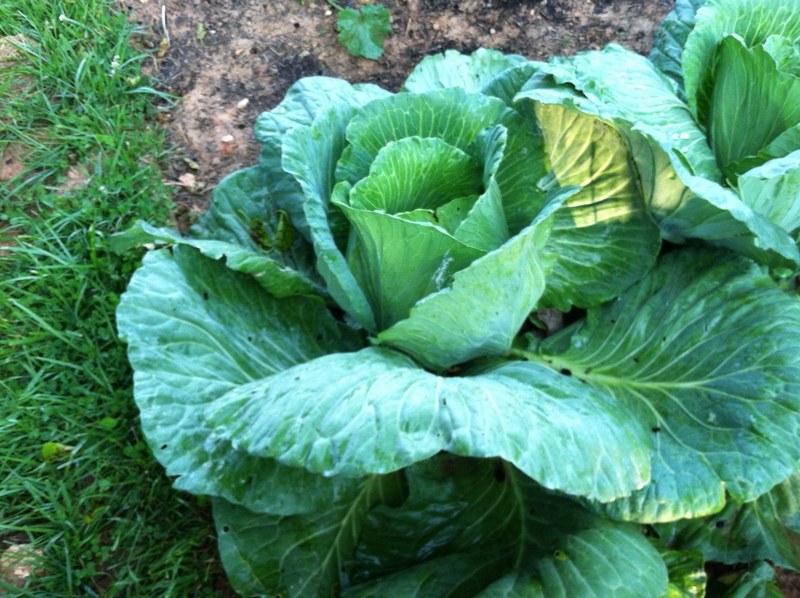 A lot of vegetables are very handsome and look good in containers or incorporated into a home landscape. I had a good friend who had this container built below out of redwood, and it has casters so that you can roll it around where you want it to go. The bottom is hardware cloth (very strong wire fencing) so that it drains properly. You could roll this around to catch the most sun. Growing in containers isn’t going to set the world on fire with lots of produce but with intensive and successive planting, it is very worthwhile. 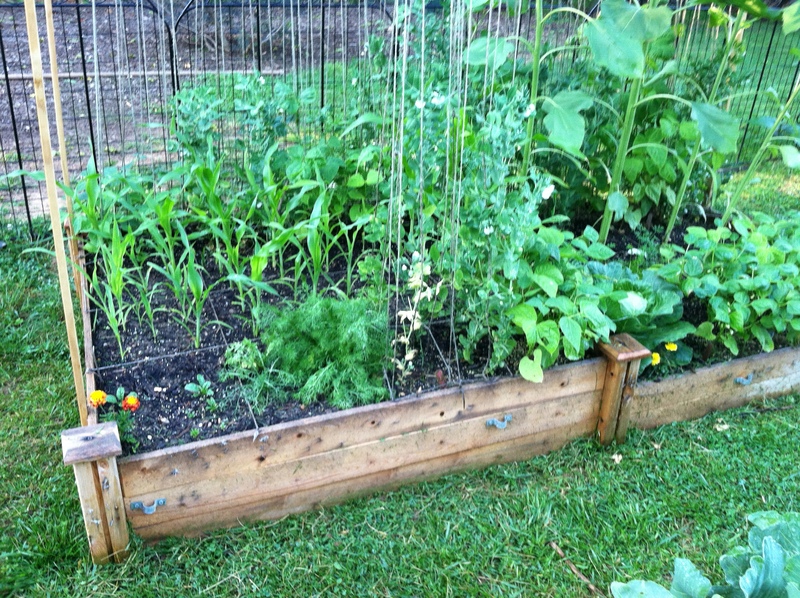 Even if you don’t want the trouble of maintaining a large tilled vegetable garden, you can do like one of my neighbors does – just gardens in tilled rows – I call it trench gardening. I like this method because your pathways don’t have to be mulched as your turf acts as a natural mulch. Again, having these permanent pathways means that you won’t compact your soil. I have always been intrigued with cooking outdoors. I did it on campfires when I went camping and still grill on charcoal frequently. 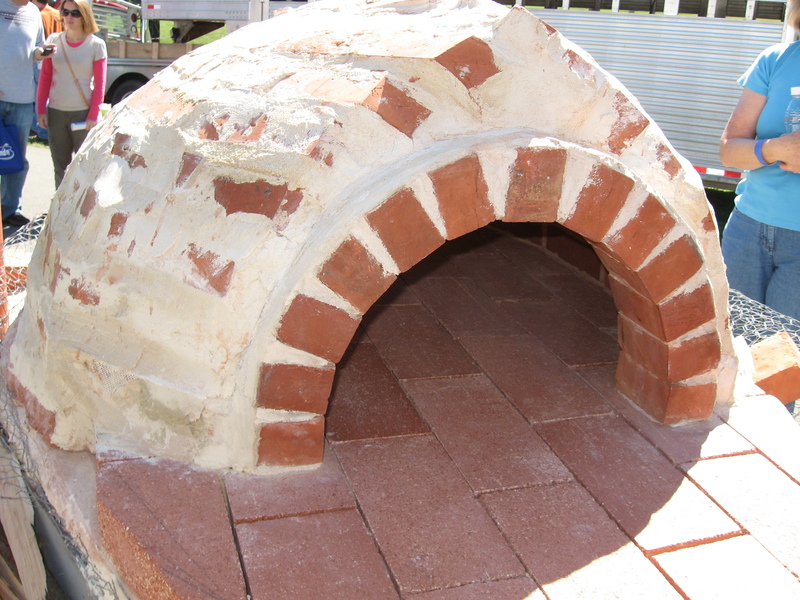 But I would love a wood fired oven for baking pizzas and breads. 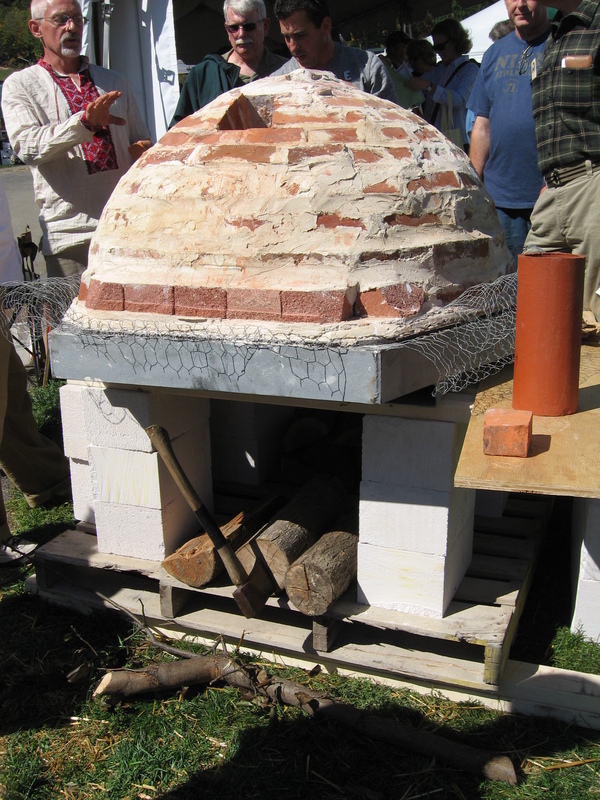 When I went to the Mother Earth News fair, they had a brick oven that you could make for your back yard on display. I would love to have that when my power goes out, which it does pretty frequently. Even with power, I would love to make wood fired pizzas. This is definitely on my list to make in the future. One of my favorite books is Animal, Vegetable, Miracle, by Barbara Kingsolver, and details how her family for one year, bought food raised in their own neighborhood, grew it themselves, or learned to live without it. You are what you eat! 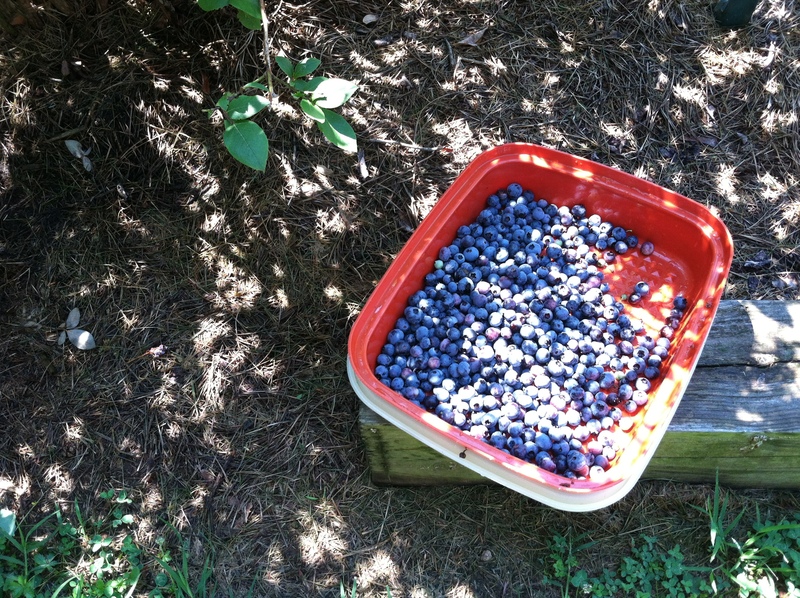 I have been growing blueberries for years and this has been a banner year for picking them. We have had plenty of rain and the weather has been perfect for growing. I have only 5 shrubs but that is enough to keep us in berries, as well as providing the birds all they want to eat. I used to cover them with nets, but they are so prolific, I let the birds have at them. Blueberries are so unbelievably easy to grow, I am surprised that not everyone has at least one of these shrubs planted on their property. They don’t get very large and have beautiful scarlet fall foliage that makes them worthwhile to grow just for that feature alone. I have several varieties to extend my picking season and there are more than 100 varieties to pick from. 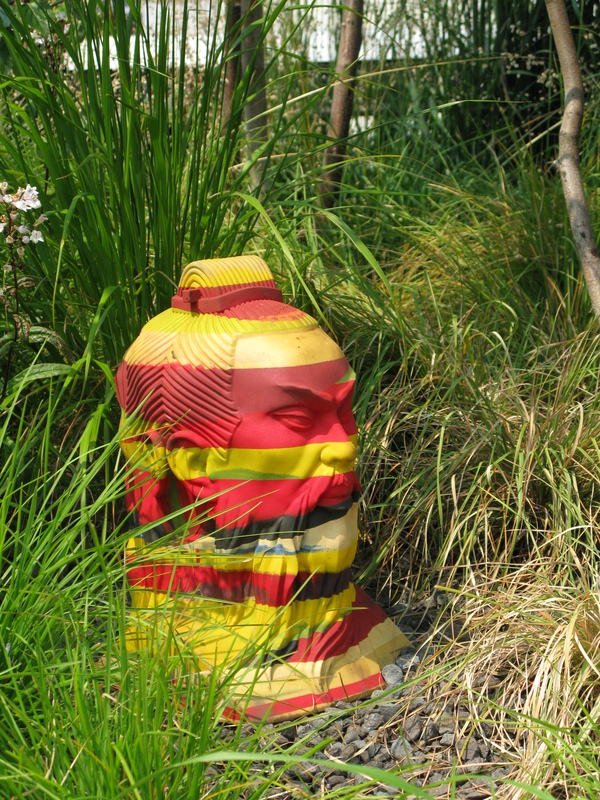 There are even dwarf ones suitable for container growing. 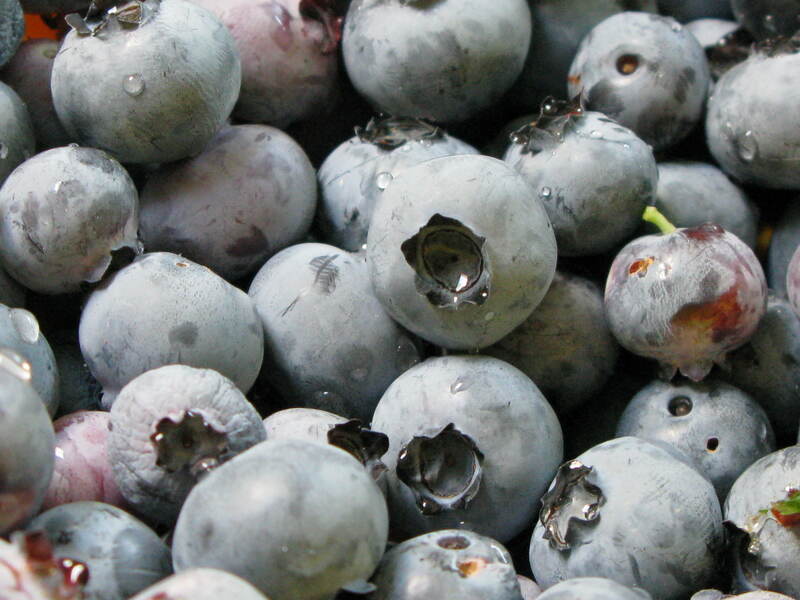 Blueberries require an acidic soil, 4.5 – 5.5 pH, much like rhododendrons and azaleas. If you can grow rhodies and azaleas successfully, then you are golden. But my soil tends to be more like 6.5 to 7 on the pH scale, so I add plenty of peat moss when planting. I continue to add it every year around the plants. I also mulch with pine needles and add an acidifier in liquid form periodically to keep the soil on the acid side. If you are unsure of your pH, you can always get a soil test done at a local garden center or the agricultural extension service. Add some cottonseed meal or blood meal as a high-nitrogen organic fertilizer twice in the spring. Coffee grounds rich in nitrogen, magnesium, and potassium are an inexpensive organic fertilizer to add some further nutrients to the soil. Pests are never a problem except for the birds, and aren’t an issue if you have prolific bearers. My blueberries are in partial shade and do fine with that light. They will also perform well in full sun. 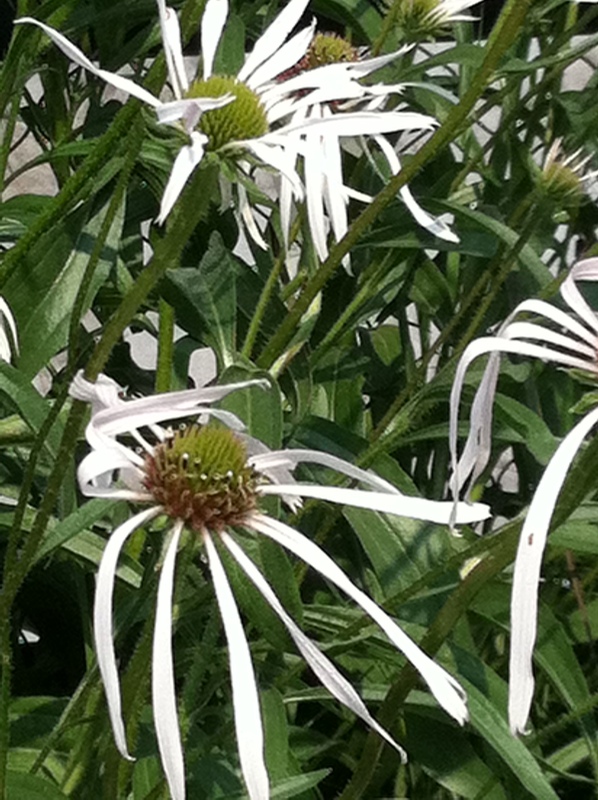 There is really no secret to pollination other than planting several varieties close to each other. For healthier, more productive blueberries, regardless of type or variety, you should plant different varieties so that bees can travel and cross-pollinate the plants. My bees are all over the shrubs when they are blooming. Consistent watering of blueberries is important because they have a shallow, fibrous root system. But I rarely water my shrubs as they are pretty distant from the hose reach. To avoid watering I layer on tons of mulch around the whole area. Once in a while when we have had some long periods of drought, I run the hose out to the plants for a good soak. The only thing that I don’t enjoy about growing blueberries is I hate to pick them! They are small and tedious to pick and take up time. The berries ripen over a couple of weeks, so you need to pick the ripe ones every couple of days. I have tried different methods, like placing a sheet underneath and shaking and pulling off the ripe ones, but I have gone back to my normal picking one by one into a Tupperware container. The shaking method pulls off too many immature berries and wastes them. I enlist help and ask people who want some berries to pick them and leave me some too. 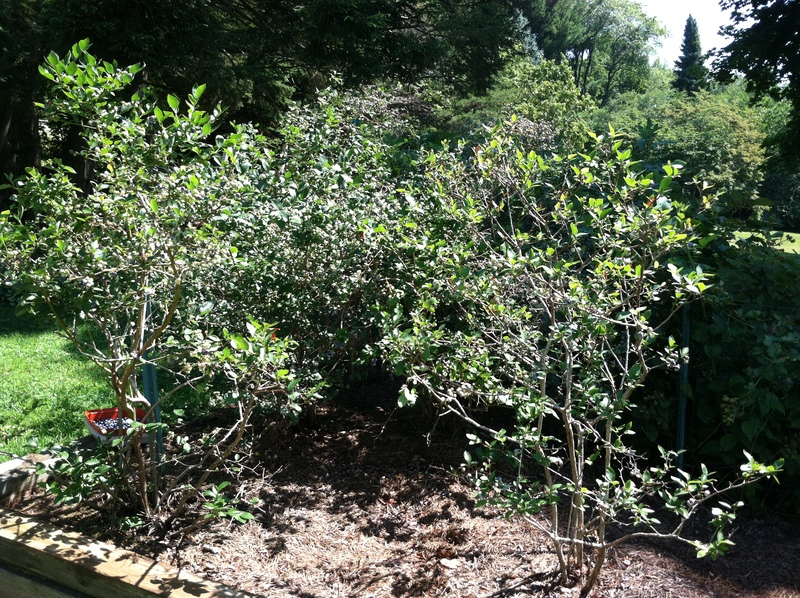 Pruning the shrubs to make them more compact, and to get rid of older branches that bear less fruit, is a matter of a few minutes in the late winter. This annual pruning forces the shrub to produce new wood that will bear larger, more abundant berries. Summer – harvest fruit and enjoy! Blueberries are the perfect health food. They are nutritious, have anti-oxidants, and require little preparation. 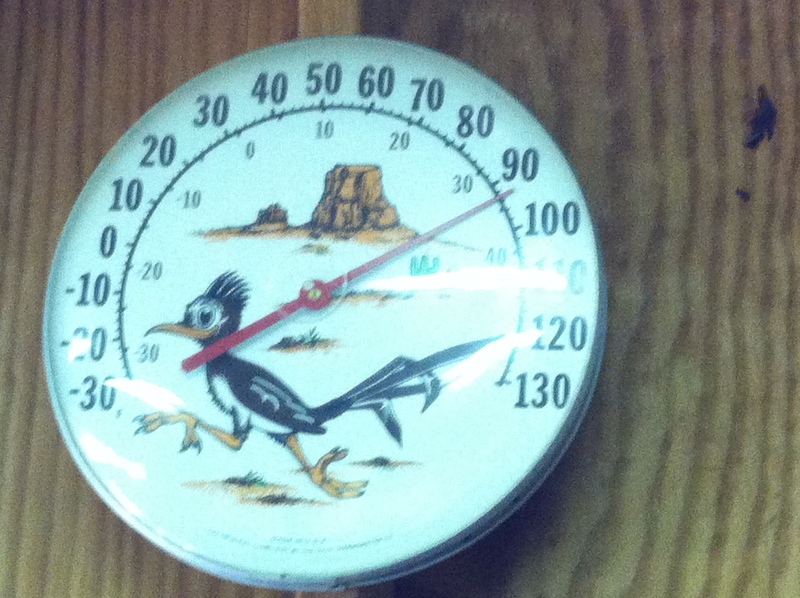 Freezing easily and going well with so many foods and desserts are among their many attributes. Everyone has recipes for muffins, pies, and cakes using blueberries so I wanted to pass along a great recipe that I use for meat! This is a great sauce and you can use either fresh or frozen blueberries. Melt butter in large skillet and saute shallots for 3 to 4 minutes. Sprinkle in the flour, blending and stirring until mixture begins to bubble. Add vinegar, ketchup, mustard, orange juice, molasses, thyme, and sage, and stir until combined. Add blueberries and raise heat to medium-high to bring to a boil. Reduce the heat and cool, stirring often for about 15 minutes until the mixture is thickened and glossy. Season with salt and pepper. Serve warm over steak. 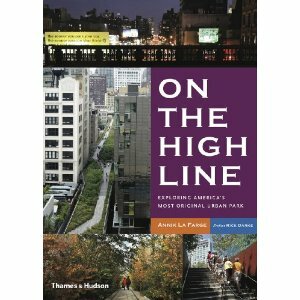 I just came back from a day trip to NYC where I went to experience the ‘High Line‘. I have heard so much buzz from the media and friends on this new park in NY that I made a special trip to see it and was totally unprepared for the scope and genius of this project in deep urban America. I took with me my artsy daughter and boy friend who are not really into gardening but once they saw what I was babbling about, they were all over it! 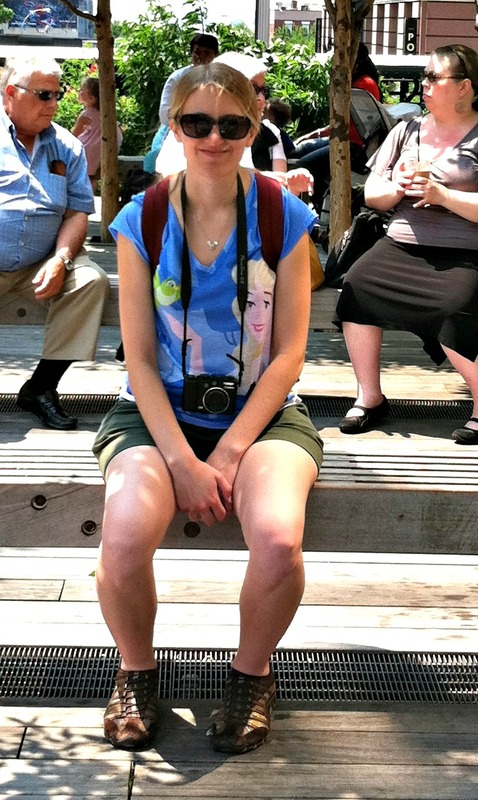 My daughter was interested in it from an artistic and photographic standpoint, and the boy friend was interested in the High Line because he was into trains and architecture. 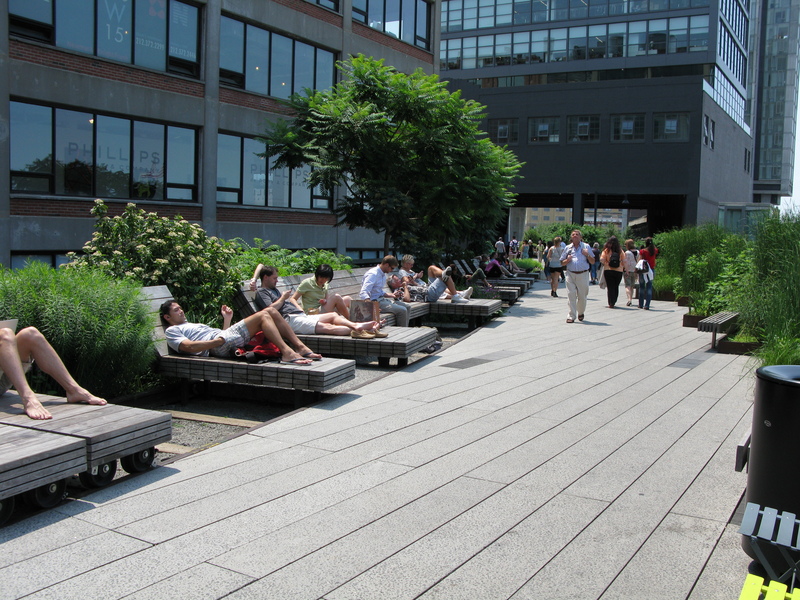 Also, we are all into the food scene and Chelsea Market and food carts are located nearby and on the High Line. So, it was a win win for me and them. 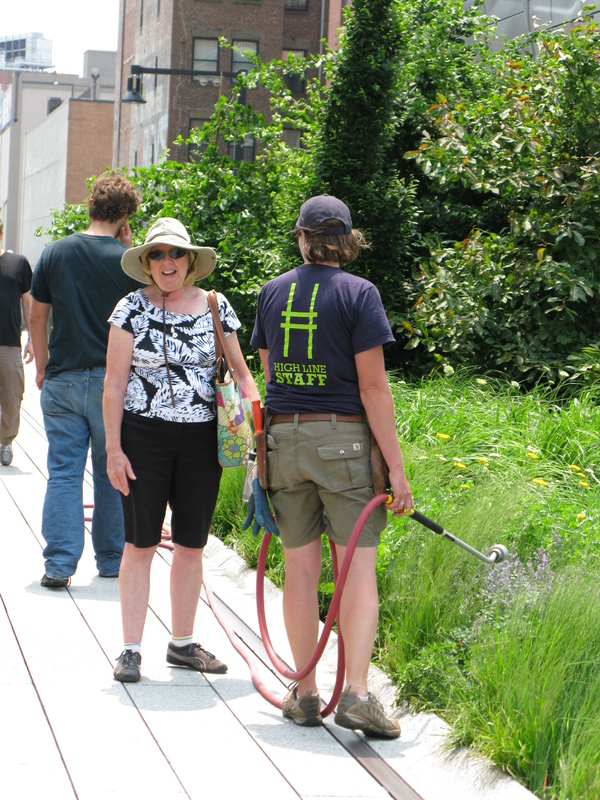 With both public and private investment, the Friends of the High Line, which was founded by community residents, works to make sure that the High Line is maintained for all visitors to enjoy. They oversee maintenance, operations, and public programming for the park. They offer free and low-cost public programs, including talks, films, performances, tours, and family activities. I checked the posted calendar that was displayed at the end of the park in an informational exhibit and there were loads of activities on tap including weekly stargazing nights. 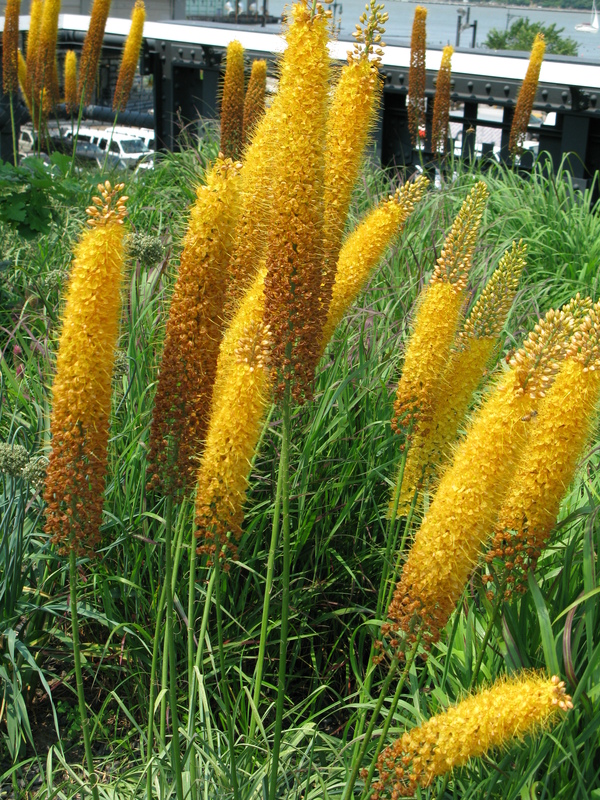 Foxtail Lilies at their peak- I was very surprised to see these growing as I thought that they were diificult and tempermental to grow! They were everywhere on the High Line. So, you see the planning and evolution of this park was over a number of years and has come to fruition just within the past couple of years. The first part was started in 2006, completed in 2009, and the second section opened early June 2011, and a third phase was just approved and is in the planning stages. In addition, at the southern end of the High Line, a new Whitney Museum of American Art is underway. 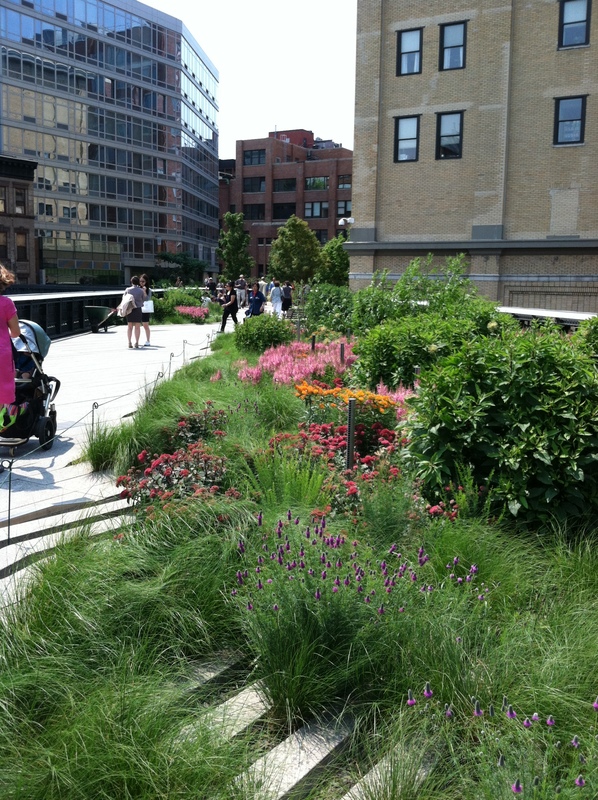 Approximately 1.5 mile in length, the High Line varies in width throughout from 30 to 50 feet but seems much wider because of the profusion of plantings. Walking the entire length as it meanders through three dynamic New York City neighborhoods of the Meatpacking District, West Chelsea, and Hell’s Kitchen went by quickly with lots of plant gawking and people watching. Sculpture installations and several photo shoots with high fashion models were happening with hardly a second look from onlookers. I guess it just happens there every day! The entire bridge structure had to be stripped of the gravel ballast, rails, soil, debris, and a layer of concrete. Then the outside had to be sandblasted in a containment tent to remove the original lead paint. The Art Deco railings had to be repaired and fabricated to restore everything to original condition. In many locations, original train rails were restored to their former locations and you can see the rails integrated seamlessly as part of the planting landscape. Ingenious! The walkway is a series of long ‘planks’ forming a smooth, linear, walkway surface with viewing platforms, sun decks, and gathering areas. There is even a lawn area where people are free to play and picnic. It was roped off when we were there for rejuvenation. I guess too many people trampled it down! Energy efficient LED lights were installed for night time, and stairs and elevators were installed at intervals for access. Pigeon-proofing, a drainage system, and a layer of waterproofing on the underlying concrete were the final steps in preparing the structure for planting. A neat water feature with water recirculating out of vents washing across the pavement. A nice place to put your bare feet on a hot day! The inspiration for the planting design was the actual self-seeded landscape that sprang up after the abandonment of the rail tracks. Tough plants seeded in the gravel ballast and made a home there in the tracks and thrived without any attention. Sustainability, which is the latest buzzword among gardeners and landscapers, was the keyword when picking out the plants. This just meant choosing native and hardy species that were interesting in color and textural qualities. 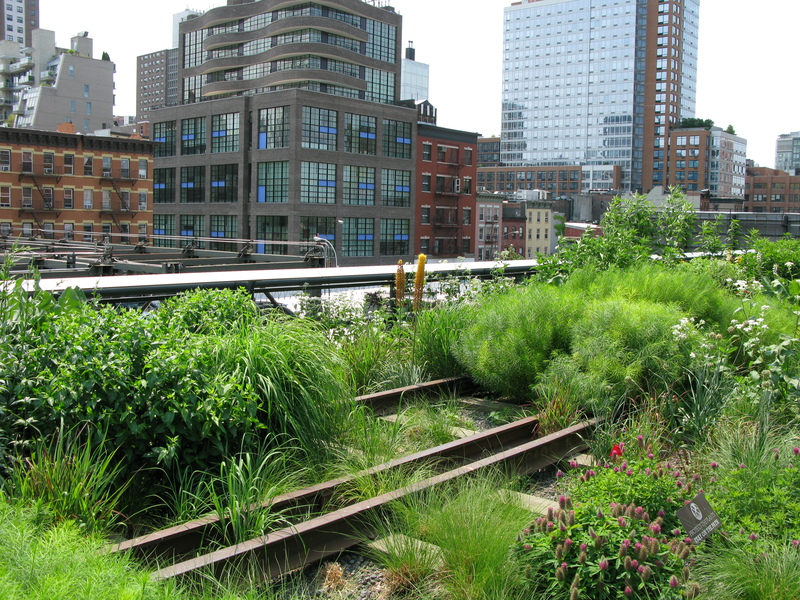 Many of the original plant species that thrived on the tracks were incorporated into the final plan. 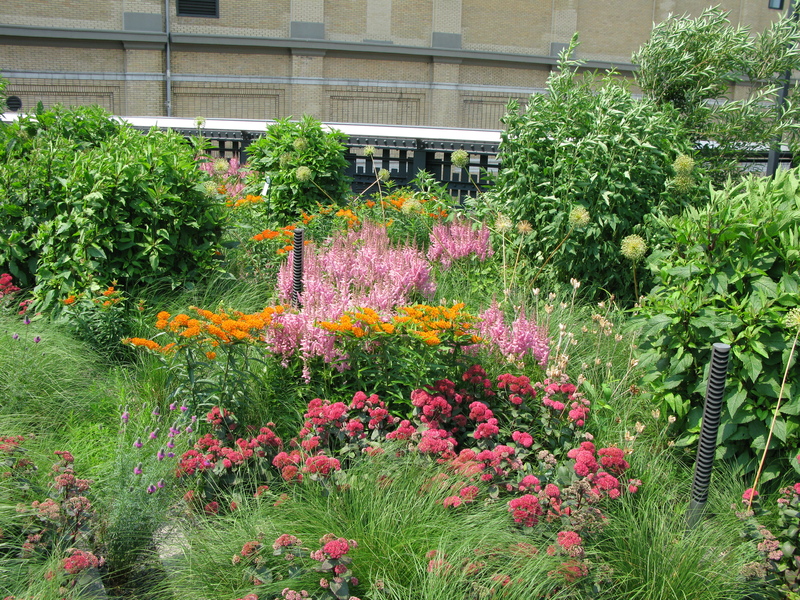 Piet Oudolf, who was the planting designer, is known for his embrace of the New Perennials Landscape movement. 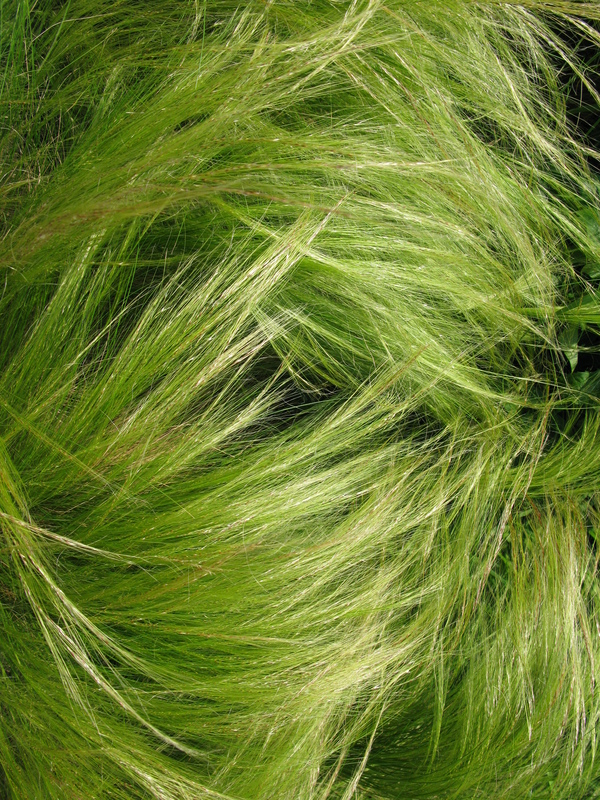 In a nutshell, this movement stresses shape and texture more than color of the plant. The life cycle of nature is important with a four season interest, not just spring and summer. Mr Oudolf, who is Dutch, actually thinks that a garden is more interesting in winter and that as gardeners we should be more accepting of death and decay. In practical terms, Mr Oudolf designs with a preponderance of grasses because they are easy to use and have appeal in larger public landscapes rather than the smaller ones at our homes. I have to say this really struck home when my daughter exclaimed over the swaths of Mexican Feather Grass that were used in many places on the High Line. When I told her that I had some clumps of it at home she said she had never noticed! Evergreens are used sparingly according to Mr Oudolf’s vision to add depth in the winter when a landscape should be browns, tans, and sienna hues rather than a green landscape. 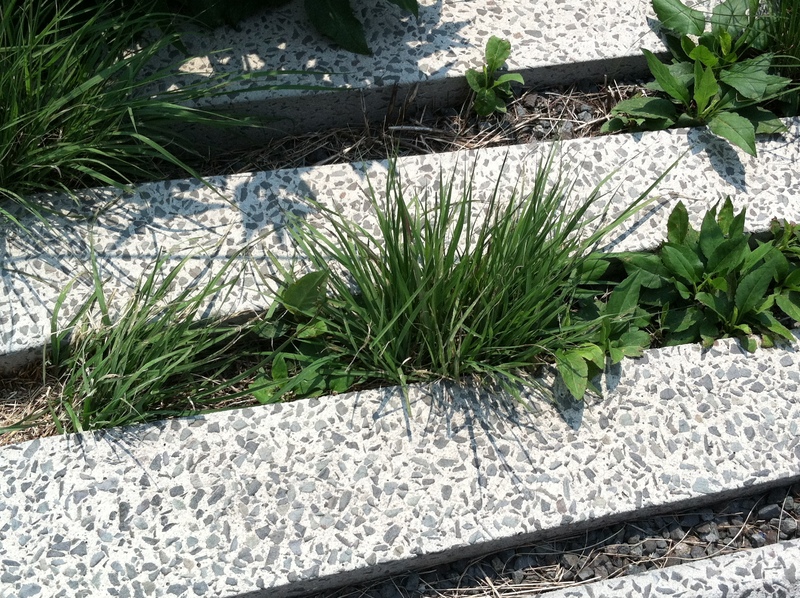 There are “cracks” in the pavement created for the plants to grow where the path bleeds into garden and vice versus. The little mulch that is used is gravel to resemble the ballast rather than the more familiar decomposeable organic mulch. 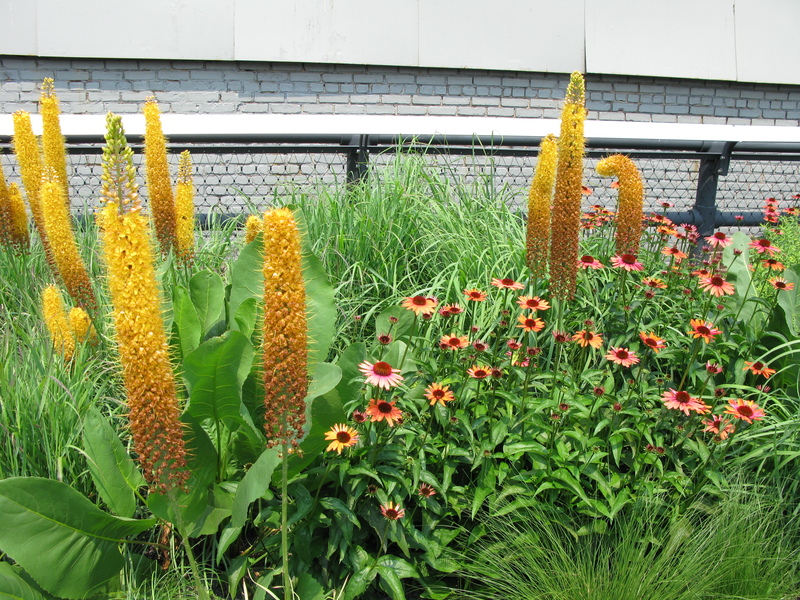 The conditions for plantings of the High Line is hot, hot in the summer and freezing in the winter. 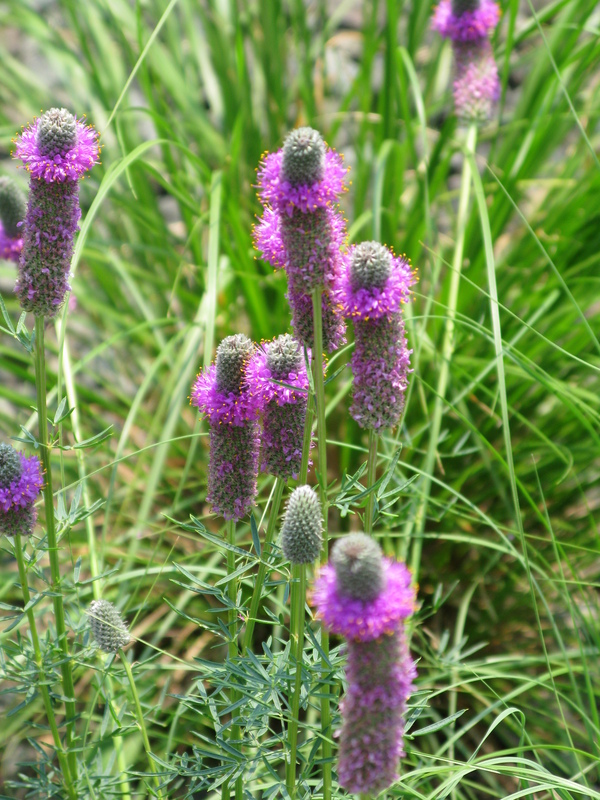 To experience extremes of temperatures is stressful for many plants but the selected plants were used to these harsh conditions such as native North American prairie perennials. 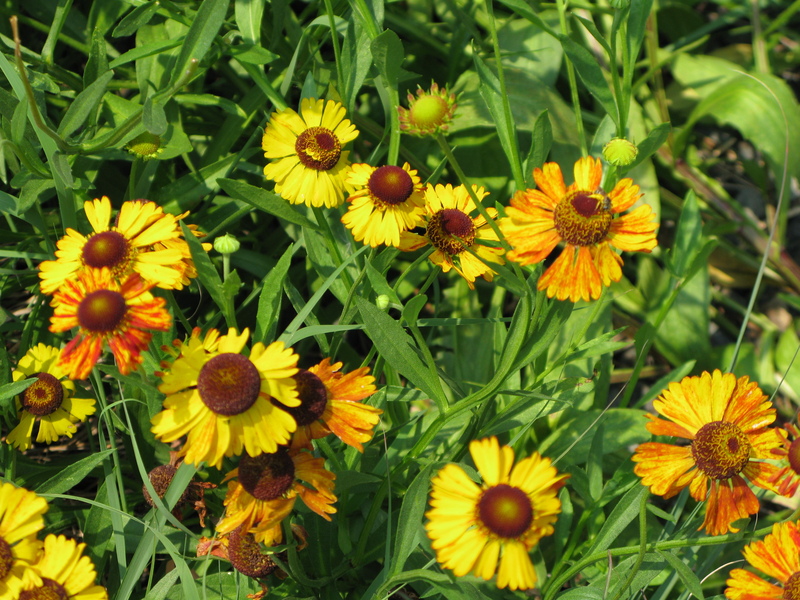 Annuals are not used as they would have to be replaced and are not a sustainable plant. When I was walking, there was a stiff breeze blowing probably because of the height of the plantings. 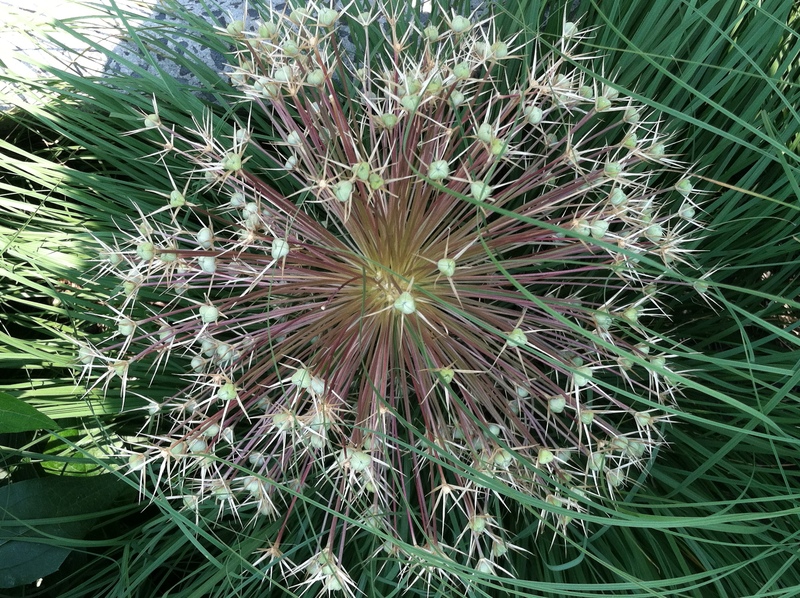 Out of 210 plant species used, 161 of them are native to the New York area. Astilbe ‘Visions in Pink’ is the light pink and the orange is Butterfly weed. Who knew that Astilbe would grow like this in full sun? 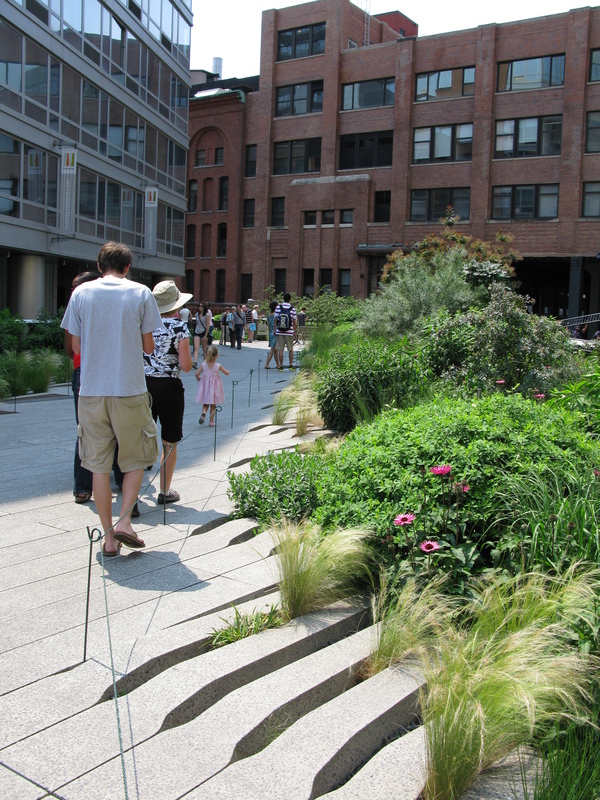 The soil depth of the High Line is around 15 inches! This fact absolutely amazed me. The depth does increase somewhat where there are raised areas but only to about 36 inches at the most. There are lots and lots of trees – Birches, Magnolias, Service Berries, Sassafras, Hornbeams, Crabapples, Red Buds, Dogwoods, Smoke Trees, Black Gums, Pines, Maples, and Witch Hazels. Sassafras is used frequently. The use of so many Sassafras surprised me as I never use it in a home landscape setting. It is a native and is everywhere in our woods and it does have magnificent scarlet fall coloring. Sassafras is an important bird food source and is the host to the Swallowtail butterfly. The list of species goes on and on and I can’t believe that they are thriving in such a thin layer of soil. 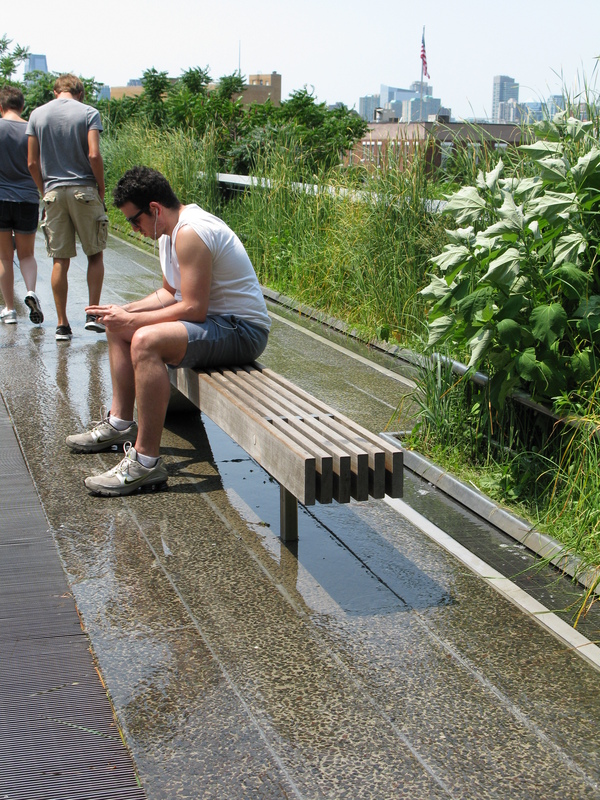 The small amount of soil makes the entire High Line an elevated container that dries out quickly with the beating sun and the relentless wind. The first part of the High Line has irrigation and additional irrigation is being installed soon in the other second part. Hose outlets were installed at periodic areas for easy hand watering. Because of the intensely planted beds, the plants must always be thirsty. One advantage of the wall to wall plantings is that it is harder for weeds to take root but nothing eliminates weeds growing and that chore still has to be done. This is an urban landscape and you can’t escape the commercial outlets. There were several vendors, art and food, that you encounter along the way. When we were there, a group exhibition called “Lilliput” inspired by Swift’s Gullivers Travels, brings together nine sculptures of reduced scale by six international artists. 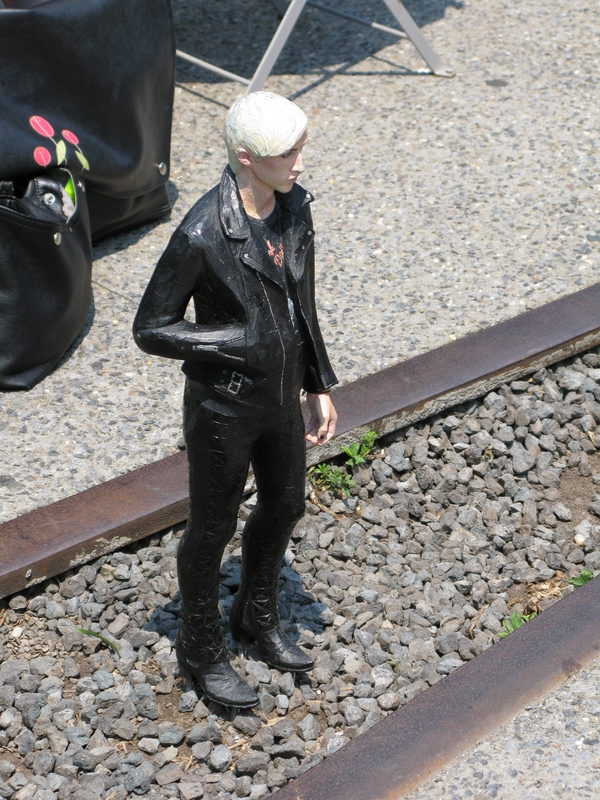 The sculptures are installed along the High Line in unexpected locations and it became a game for us to find them all. Go to www.thehighline.org/art to view them. 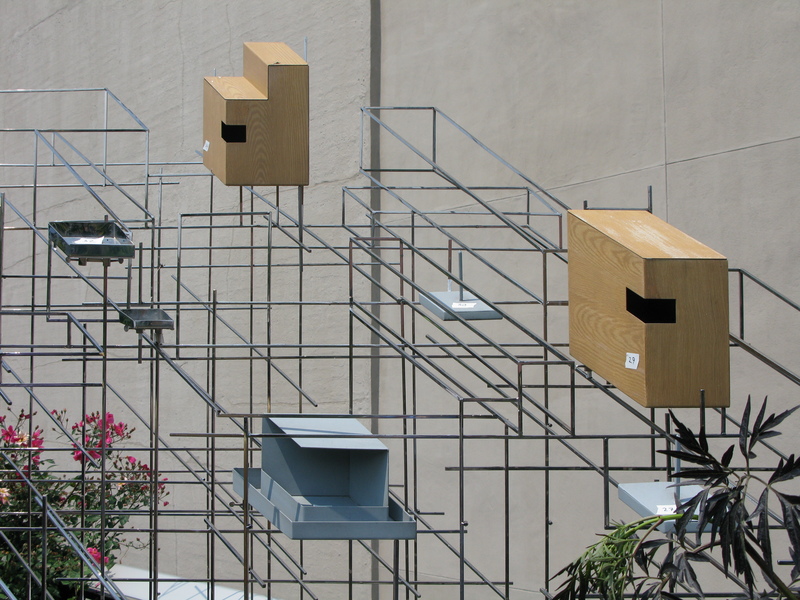 Lots of apartments looked directly onto the level of the High Line and we were amused with residents art installations. 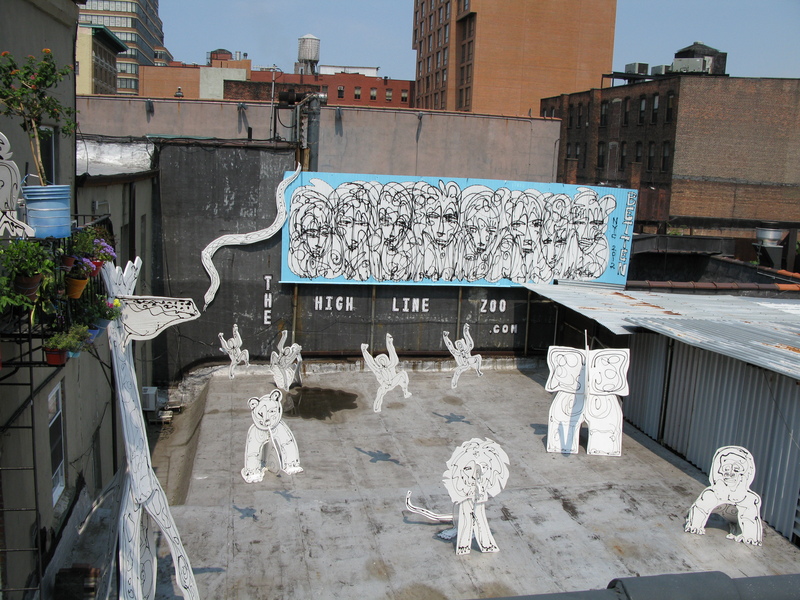 “High Line Zoo”, Someone having fun with their artwork! 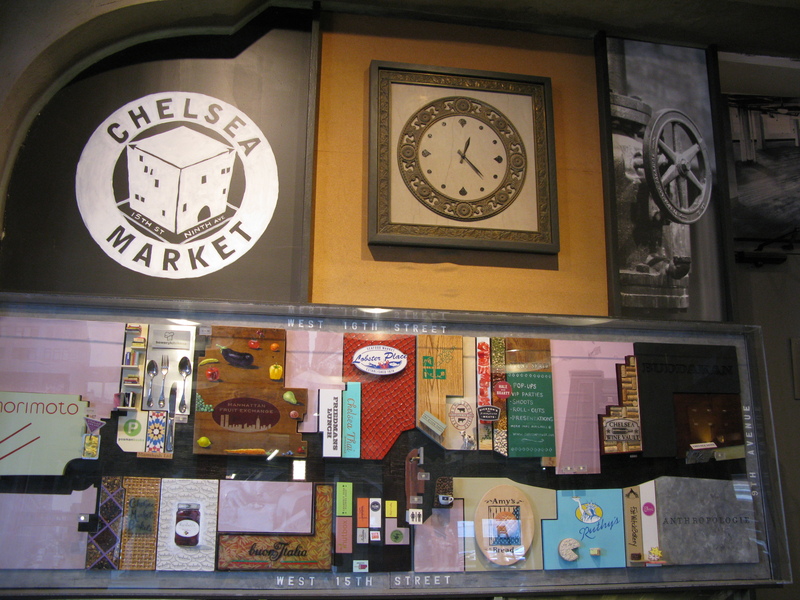 We went down the stairs to street level Chelsea Market and picked up some goodies and shopped the interesting stores. 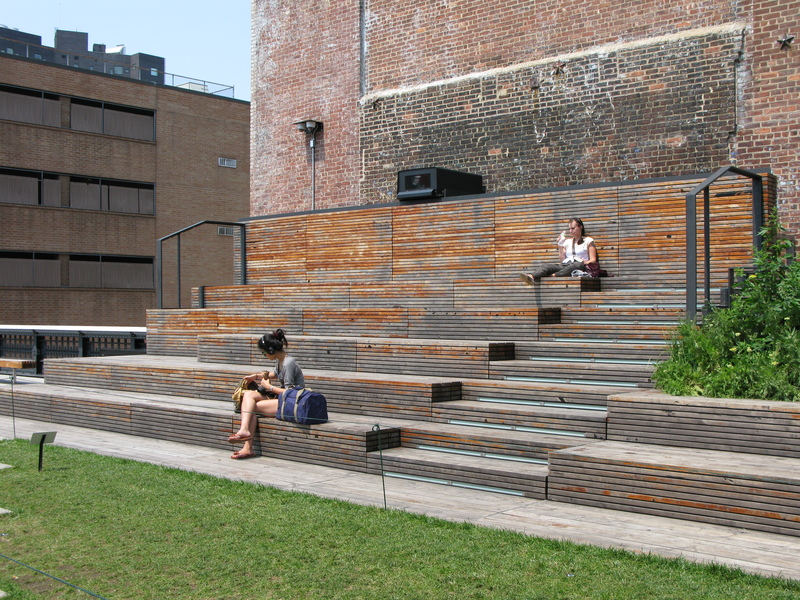 Then we headed back up to the High Line and picked up more food from Bark and The Taco Truck on the High Line passage. There were tables and chairs set up in the shade on the passage which is just a large tunnel to enjoy the food. The tables were pretty full on a Monday so I think that on the weekend it could be a mad house. As in any park, you need places to sit and relax and unwind. 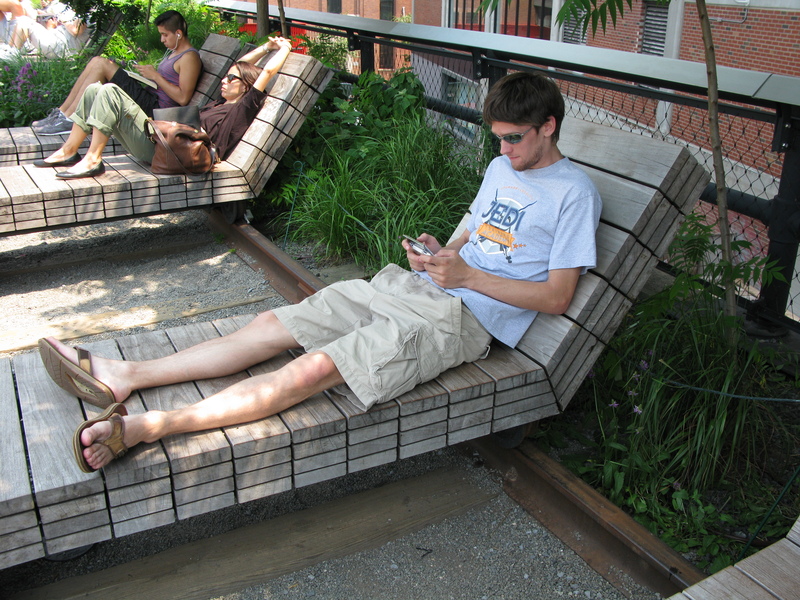 There were plenty of innovative seating areas to take a load off and we didn’t have to fight anyone to get a spot. They were scattered everywhere. 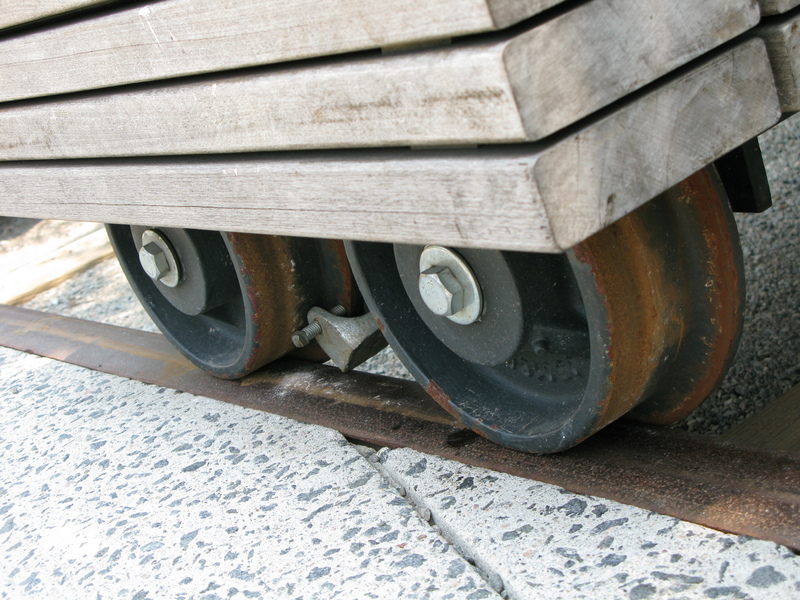 The most ingenious seat was the wooden lounge chair that made use of old train wheels that were placed in the track. 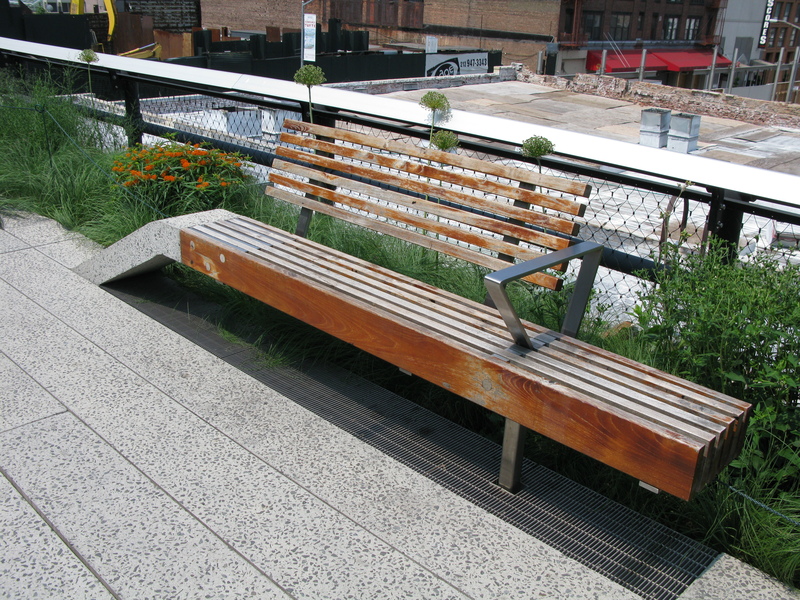 Along with the NYC Department of Parks & Recreation, the Friends of the High Line employs 6 to 8 gardeners or horticulturists to maintain the 6.7 acre park. Talking to the gardeners who were working diligently weeding, cutting back, and planting, they were really excited about gardening in downtown Manhattan. I asked how they disposed of their organic debris and they said that they collect it in a central location on the High Line and then it is picked up and taken to Fresh Kills landfill. 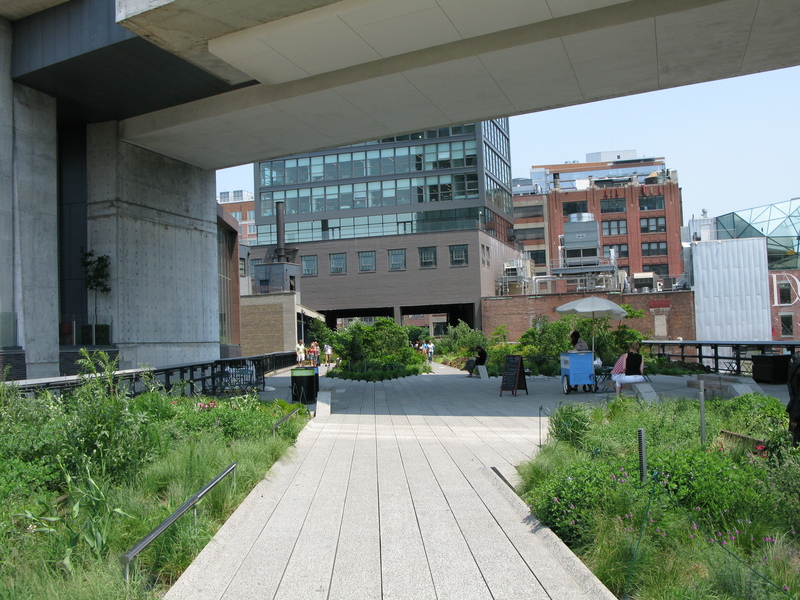 It seems like there should be a composting area located on the High Line so that they can compost it on site and use it to enrich the plantings. If they set up a working composting area with informational signs and demos, I think that it would send an important public message for sustainability. 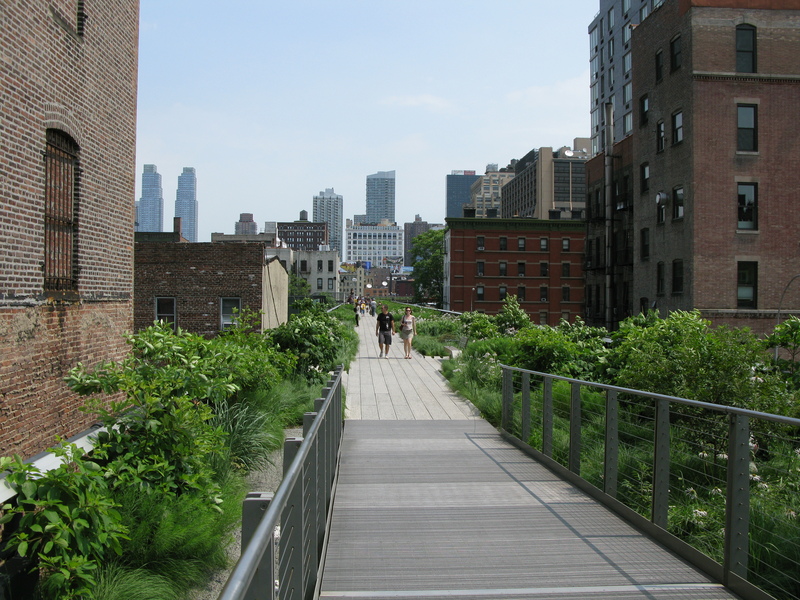 The High Line is not the first converted elevated rail line. Paris started it all in 1993 with one called Promenade Planteé which is almost 3 miles long. Also, St Louis, Philadelphia, Jersey City, Chicago, and Rotterdam has them in the works. Next stop, Paris! I just finished reading ‘American Grown’ by Michelle Obama and it is a fascinating account of the garden and landscape evolution at the White House. From the very first vegetable garden installed by John Adams, our second president, the book mentions a variety of plantings and gardens until it ended up being a hodgepodge of styles and designs in the 1930’s. At that point, President Franklin Roosevelt asked the renowned Frederick Law Olmstead Jr., a landscape artist who designed Central Park in New York City, to draw up a master plan. Olmstead created the vistas and features that we are familiar with today – notably the South Lawn with rolling lawns and groupings of trees. The landscape that he created is what basically remains today. The book also includes how-to tips for starting your own kitchen garden, involving children in the process, and several accounts of how schools across the county are changing their students eating habits and getting them to be more active. Recipes from the White House Executive Chef Cris Comerford using the produce were my favorite part as well as dozens of black and white historic photos. 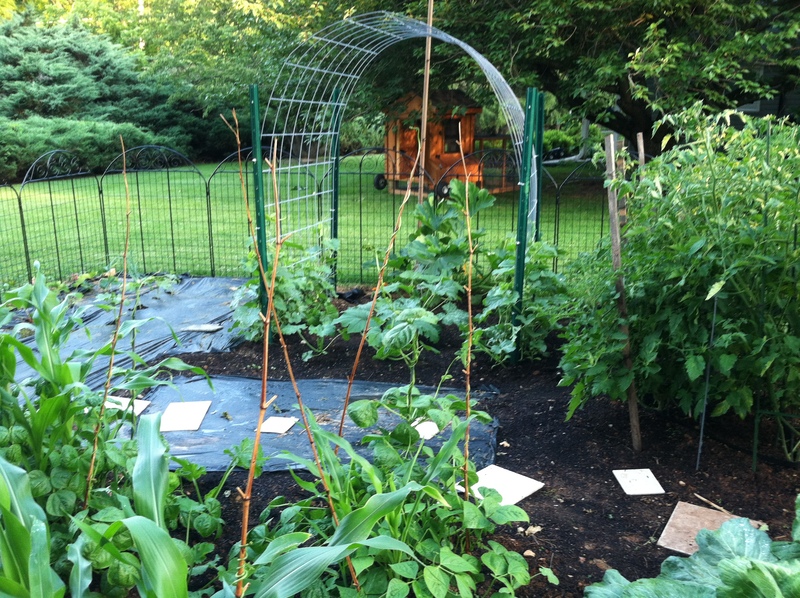 The 1100 square foot L-shaped vegetable kitchen garden is on the White House south lawn in raised beds with slate plant tags, and has a path winding through for easy access. Michelle Obama wanted the location of the garden to be easily seen from outside the White House gate because she wanted it to be the people’s garden, just as the White House is the “people’s house”. Peas, spinach, lettuce, broccoli, raspberries, blueberries, carrots, tomatoes, figs, mushrooms, and peppers are just a few of the over 55 varieties of vegetable and herb crops that are planted and harvested for use in the White House kitchen. Mushrooms were even grown on logs that were placed under trees! All produce is used for family meals and state dinners and is also donated to Miriam’s Kitchen, a local soup kitchen. The garden is grown organically with edible and companion flowers planted along the path and numerous herbs, and has produced thousands of pounds of produce. The garden was started in 2009, early in the Obama’s term, and was instrumental in the First Lady starting her ‘Let’s Move!’ campaign which focused on healthy eating and exercise. The First Lady along with White House horticulturist Dale Haney and the enthusiastic help of 23 5th graders from Bancroft Elementary in D.C., plant the garden every spring and takes care of the garden as well as learning about eating healthy. White House Chef Sam Kass, who personally harvests many of the herbs and vegetables for the meals he cooks, was inspired after a visit to Monticello to include an area devoted to Thomas Jefferson where the vegetable favorite’s of the third president are planted. Monticello sells a special seed collection that Jefferson grew at his home that includes Tennis Ball Lettuce, Prickly Seeded Spinach, Red Calico Lima Beans, Sesame, Globe Artichokes, and Early Jersey Wakefield Cabbage. 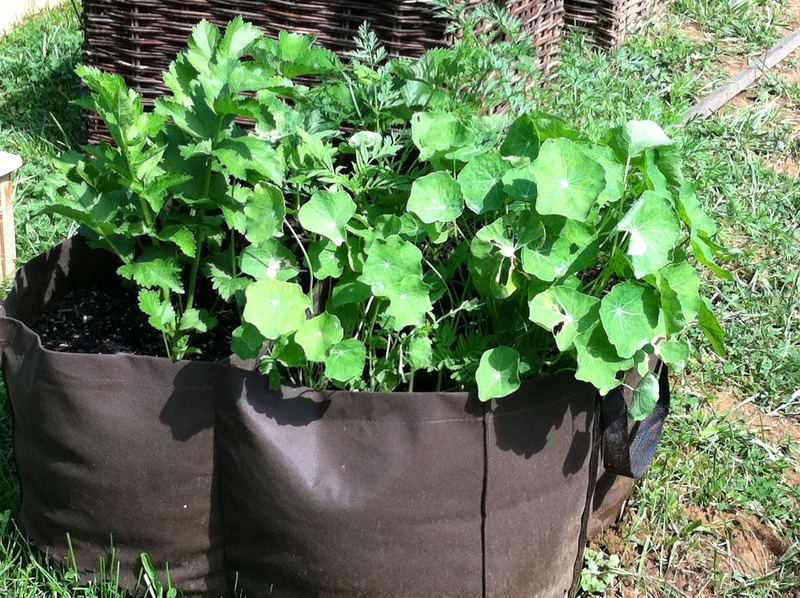 Offered by Monticello’s online store at http://www.monticellocatalog.org/, you can order this seed mixture yourself for $18. 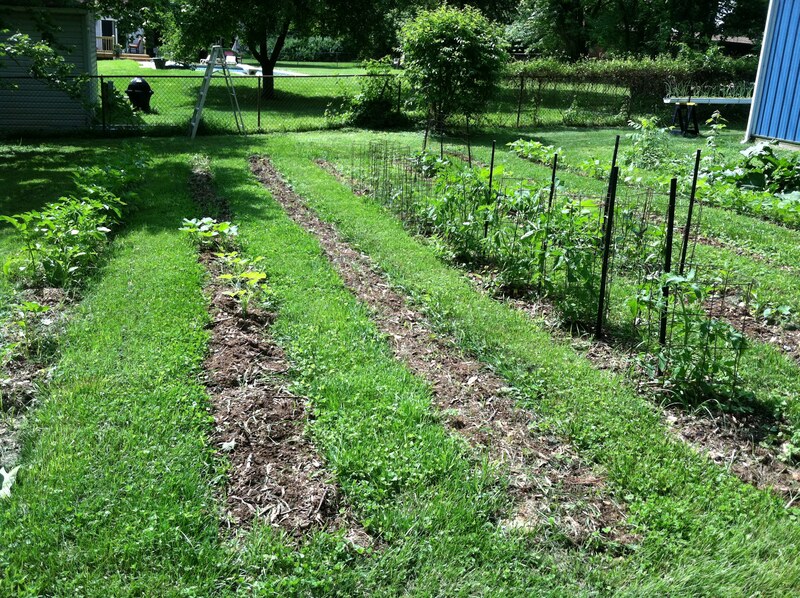 Another area of the garden is called ‘The Three Sisters’ which is corn, beans, and squash planted together. 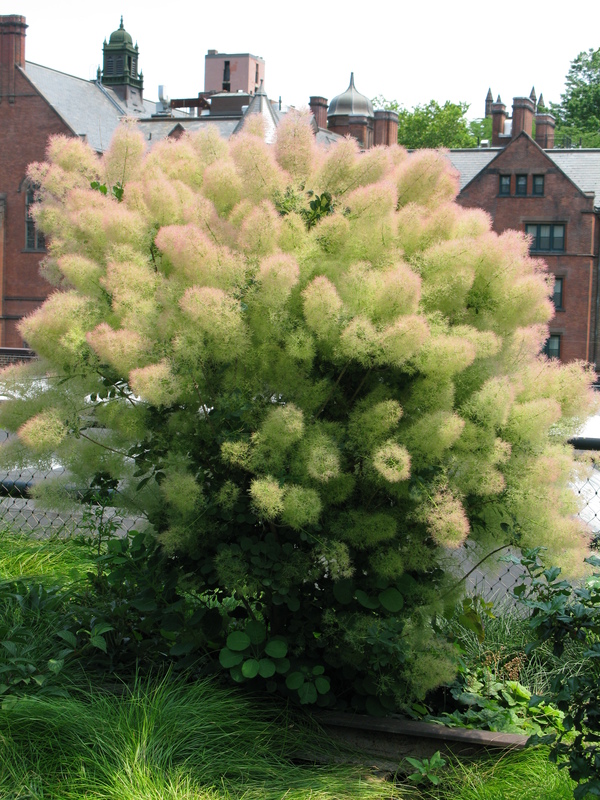 The Native Americans used this planting scheme extensively and called the three plants ‘The Three Sisters’ because they grow and thrive together. The beans grow up the corn plants for support and the squash acts as a living mulch and shades the base of the plantings. Three Sisters shown on the reverse of the Native American 2009 dollar coin. 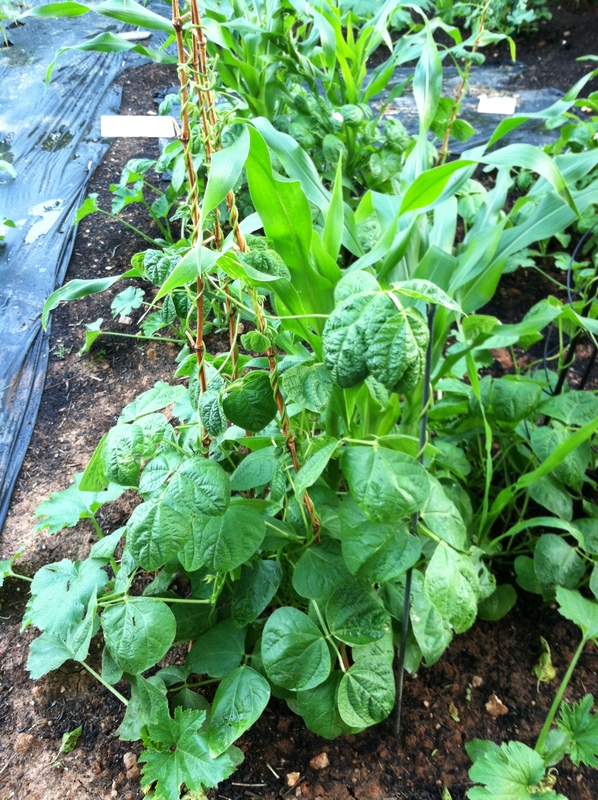 In June of 2011, Cherokee White Eagle corn, Rattlesnake pole beans, and Seminole squash seeds donated by the National Museum of the American Indian were planted in the White House garden preceded by a special ceremony and blessing by Native Americans. 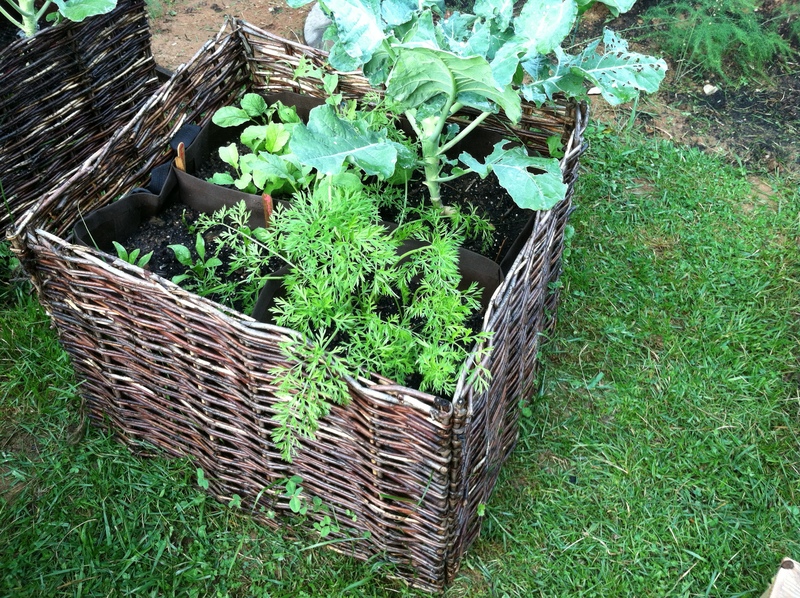 There is a great section on basic how-to knowledge to jump-start your own vegetable garden, from making compost up of ‘browns and greens’ to container gardening. I thought the most important point was to grow what you like to eat. The importance of sunlight is stressed with the statement ‘sun equals success’ which is a factor that so many people forget. Americans have a long tradition of vegetable gardening and it is time to reconnect with that heritage. The book is a great starter for any newbie. 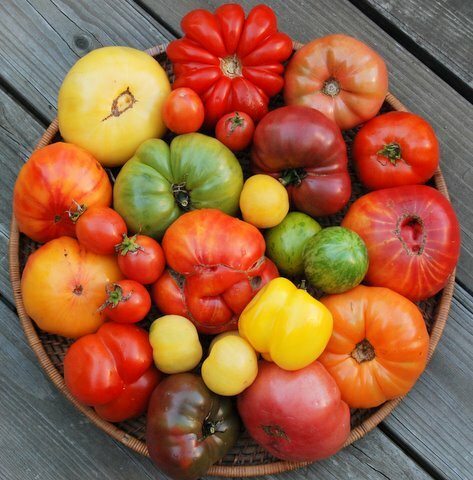 Wide variety of heirloom tomatoes, courtesy of Landreth Seeds, a seed company that sold seeds to every President from George Washington to Franklin D. Roosevelt. Thinking that kids are more willing to try healthy food choices if they are involved in growing their own food, Michelle Obama started the vegetable garden at the right time for America. Many people are concerned with organic food choices, eating a better diet and buying locally. The Bancroft Elementary School not only plants and harvests the vegetables, but also prepares and tastes the food with the White House Chef. Lucky kids! I tried two of the recipes – the mac and cheese with cauliflower, and the white bean salad, and got thumbs up from my family. Go to http://www.npr.org/2012/06/12/154854113/first-lady-fights-obesity-with-moves-and-good-food?ft=1&f= to see more recipes that sound delicious. I really was interested in Michelle Obama’s essay on lessons learned in the first season. One problem was that they grew perfectly round cantaloupes that were totally tasteless! I have had that problem also and stopped growing them. Another situation was the blackberry bushes took up too much room for the few pieces of fruit harvested. 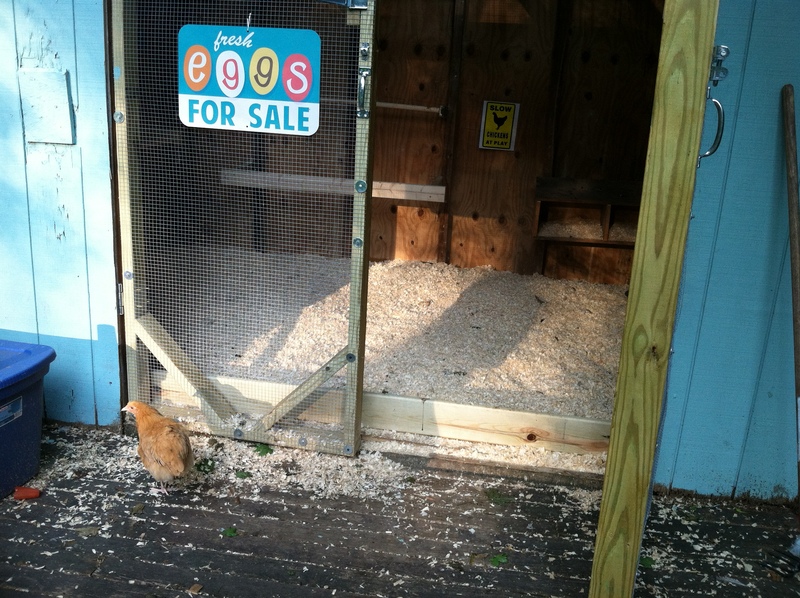 To combat this problem, I train them on a trellis. They also found that even with netting, birds ate every blueberry. I chalk that up to the plants were immature and weren’t old enough to be loaded with berries so that the birds could eat their fill. Cutworms became a problem in the White House garden and the gardeners combated that by enclosing new plants in bottomless paper cups, an old organic gardener trick. Another lesson learned was to mulch with a thin layer of straw to keep the soil moist and the weeds down. These were pretty basic common situations that many gardeners face and the White House gardeners learned through experience. This book is an inspiration for people to start their own garden and the knowledge is very basic but helpful. The garden has become a very popular tour for school kids and if you are a teacher you can tour the kitchen garden on a first-come, first-served basis by going to http://www.whitehouse.gov/ and fill out an application. The tour is free which includes the garden only, not the house, and is held every Tuesday and Thursday at 11:30 AM, weather permitting. Adjacent to the kitchen garden, is the first ever beehive at the White House that is tended by White House carpenter Charlie Brandts. This part was my favorite because it really showed how ignorant people are about honeybees. Bees will only sting unless provoked and are more interested in finding nectar than bothering someone. 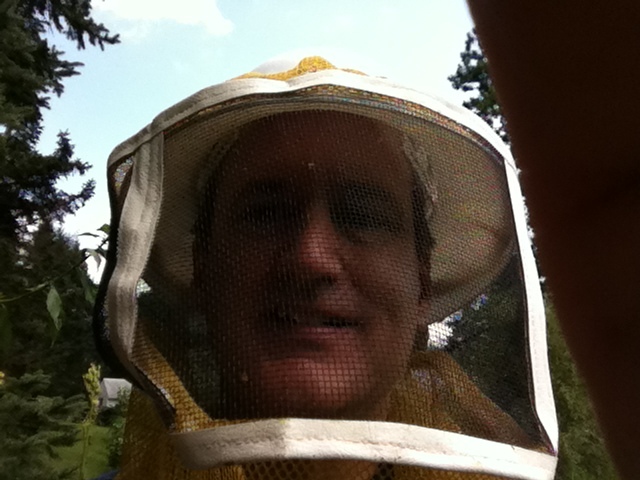 In all the years that I have had hives at my house (10), I have never had anyone stung except for me! And that was trying to remove the honey! The President initially was “less than enthusiastic” especially since the hive would be near the basketball court and he was concerned about the dog and the girls being stung. The hive was set up high to keep the entrance well above kids who visit the garden and the flight path was placed so it would be in the opposite direction of the basketball court. Also, the hive was strapped securely so that winds from the presidential helicopter wouldn’t tip it over during landings! The beehive has over 70,000 bees and honey is harvested from the hives and used in the White House kitchen. Go to http://www.youtube.com/watch?v=gNaLV8KwTr8 and watch the video ‘The Secret Life of White House Bees’ for a fascinating account of setting up the hive and harvesting the honey. To harvest the honey, Charlie Brandts smokes the bees to calm them and then blows the bees off the frames with a leaf blower! One interesting story about the White House bees is that there was an apple tree on the South Lawn for 25 years that had never produced an apple. Once the bees were installed, the apple tree produced baskets of delicious apples. That just proves how important bees are to pollination. Blossoms, fruit, and foliage of an apple tree. 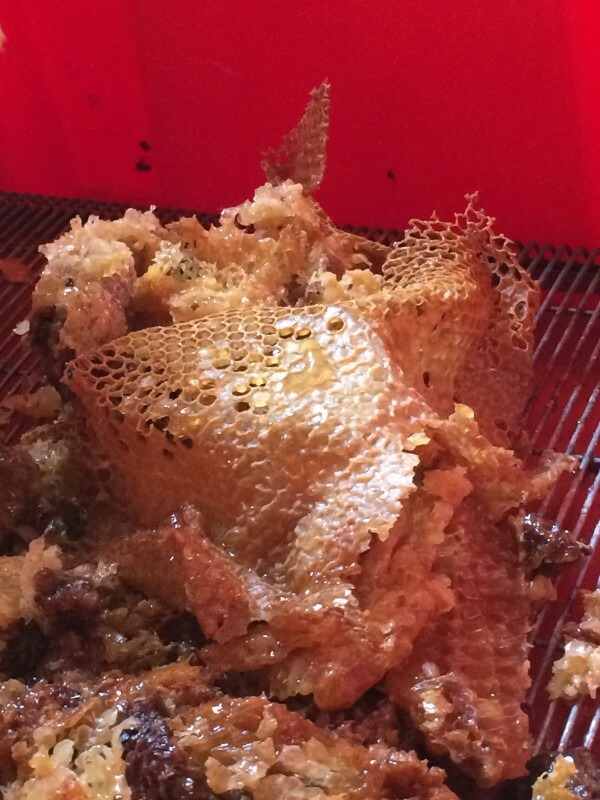 The honey is extracted right in the White House kitchen which really impressed me. 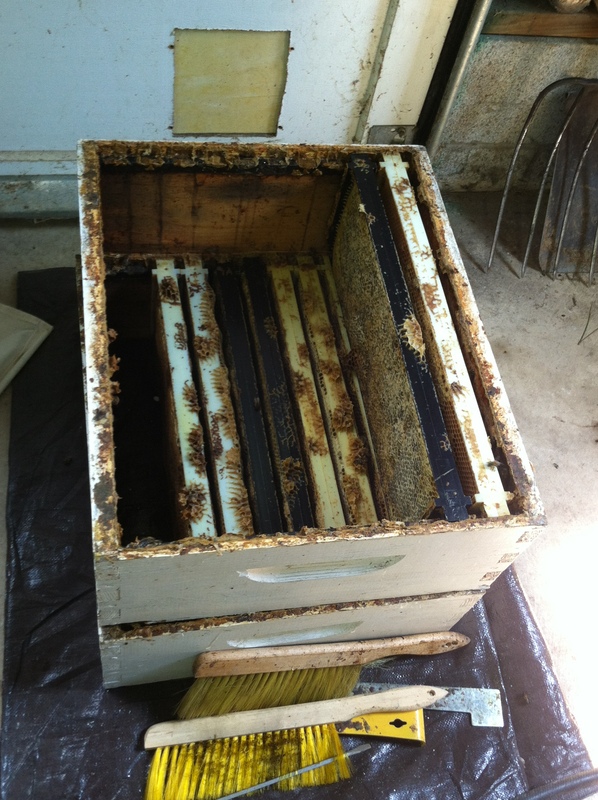 When I extract honey, every surface around gets sticky and covered with bees and I don’t do it in the kitchen! 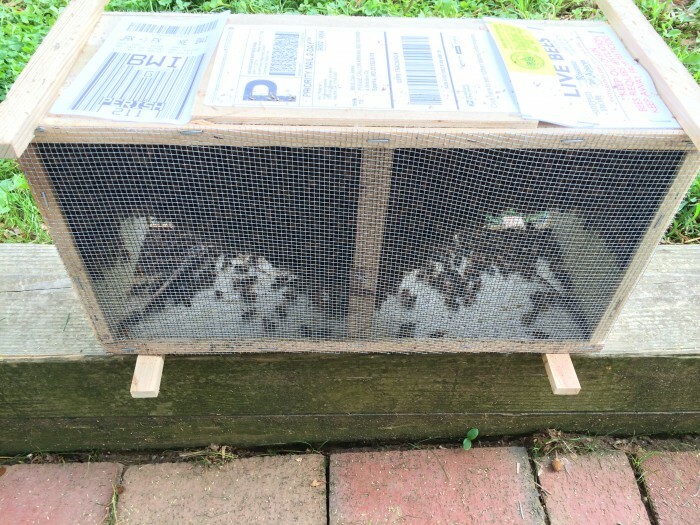 Just the one hive at the White House has produced 140 pounds the first year, 183 pounds the second, and 225 pounds the third – an impressive total! 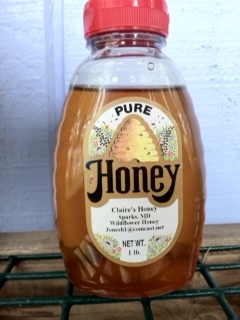 Honey is donated to Miriam’s Kitchen, used in the White House kitchen, and given as gifts to dignitaries and heads of state. 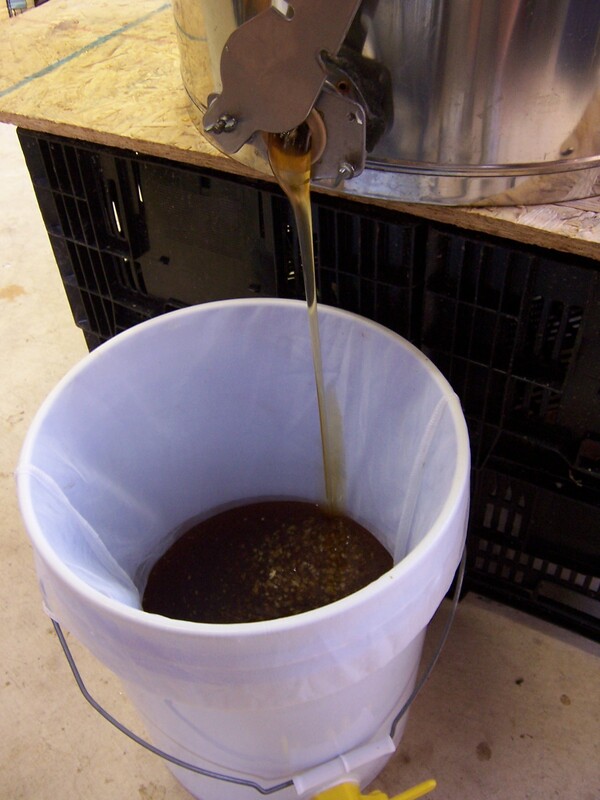 A pound of honey was used to brew the first White House honey ale! I wonder how it tasted? Michelle Obama is trend setting with her vegetable garden initiative and lots of families are taking note and starting their own vegetable garden. Even the Queen of England copied what our First Lady did and has started her own palace vegetable garden with school children. Now is the time to dust off those kitchen garden plans and start sowing! Within the past couple of years, you might have heard that bees are in trouble, growing scarcer, and suffering from a mysterious ailment called Colony Collapse Disorder, or CCD. A variety of culprits have been fingered in causing this syndrome, including pesticide use, parasites, and diseases. To study bees, scientists decided that they needed a method to determine the numbers and spread of different pollinators. 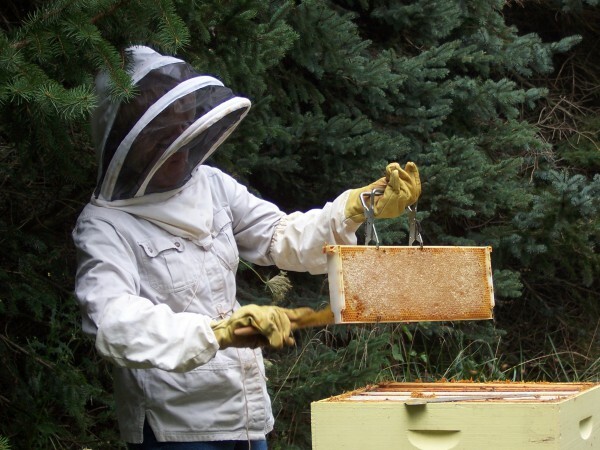 To accomplish this, a new survey was launched enlisting and empowering local citizens in reporting observations about bees in their own backyard or deck called The Great Bee Count. The Great Bee Count, recruits citizens across the United States and Canada to plant sunflowers and observe bees visiting the flower in a 15 minute time period daily and record their findings on-line. The first Great Bee Count took place about 4 years ago and countless volunteers recorded their findings to help scientists to check on the prevalence of our tiny pollinators in North America. The data is called ‘trend data’ and showed that in some parts of the country the bees are doing very well, but in other parts like Florida where pesticide use is widespread, the bees are not nearly as numerous. I participated last year and counted at least a dozen bees on my sunflowers daily in my backyard in MD which shows that this part of the country is above average ‘bee friendly’! I would love to hear from people who are not in North America to see if there are any similar projects in their country. Please let me know if you have heard of any.